© 2002, © 2016 by Paul Freeman. Revised 4/30/16. Bagdad Intermediate Field, as depicted on the June 1932 Los Angeles Airway Chart (courtesy of Scott O'Donnell). which were established for the emergency use of commercial aircraft flying airways between major cities. as it was not yet listed among active airfields in the 1930 Department of Commerce Airway Bulletin #5 (according to David Brooks). was its listing in the 1931 Department of Commerce Airway Bulletin #2 (according to David Brooks). was on the June 1932 Los Angeles Airway Chart (courtesy of Scott O'Donnell). 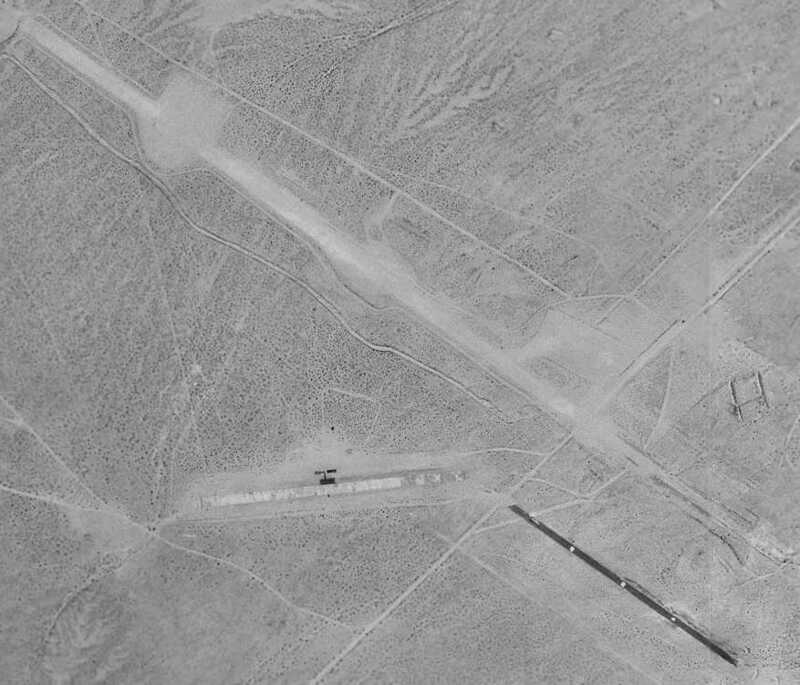 It depicted Bagdad as a lighted field with Beacon #16 along the Los Angeles - Kingman Airway. in The Airport Directory Company's 1933 Airport Directory (according to David Brooks). 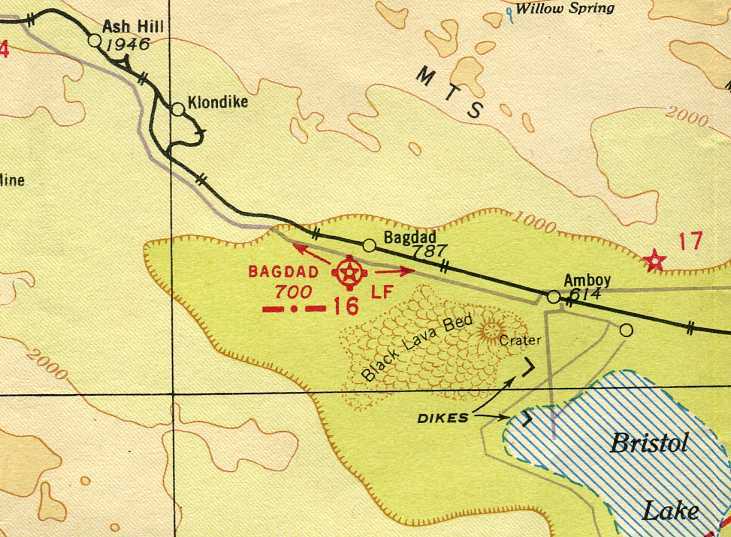 Bagdad Intermediate Field, as depicted on the June 1940 Sectional Chart (courtesy of Chris Kennedy). 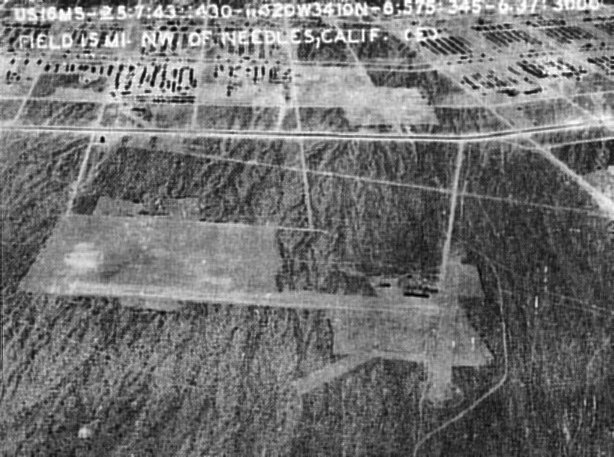 was a 6/25/43 aerial view looking north from the 1945 AAF Airfield Directory (courtesy of Scott Murdock, enhanced by Bill Grasha). 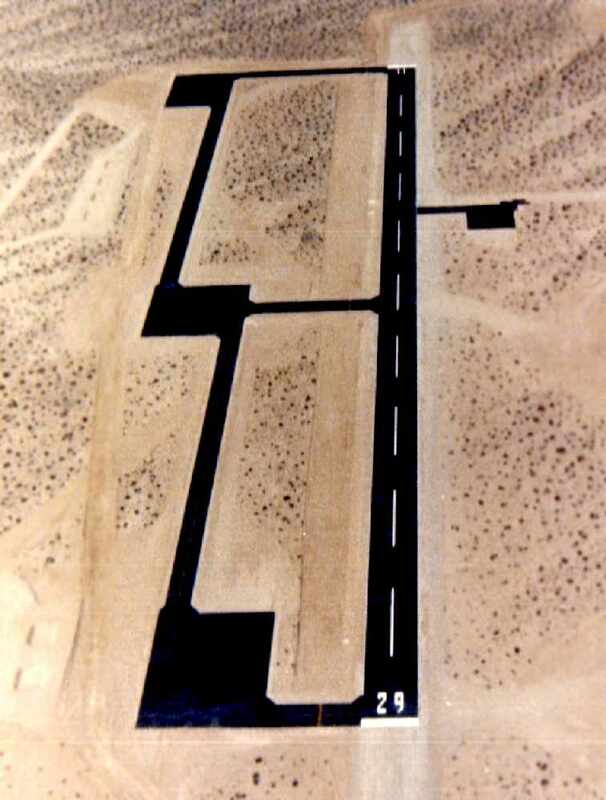 It depicted Bagdad as having 2 unpaved runways in an L-shape. There did not appear to be any buildings at the airfield. 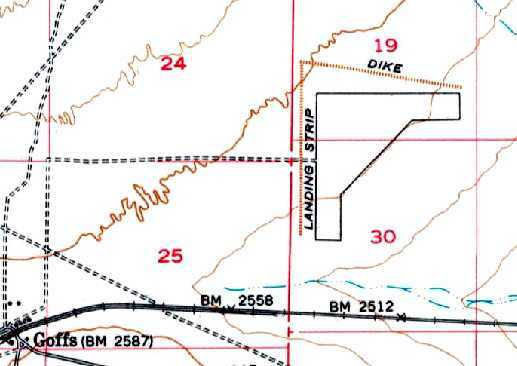 as a 156 acre L-shaped property having 2 rough gravel 3,960' runways, oriented north/south & east/west. to be owned by the U.S. Government, and operated by the Civil Aeronautics Administration. 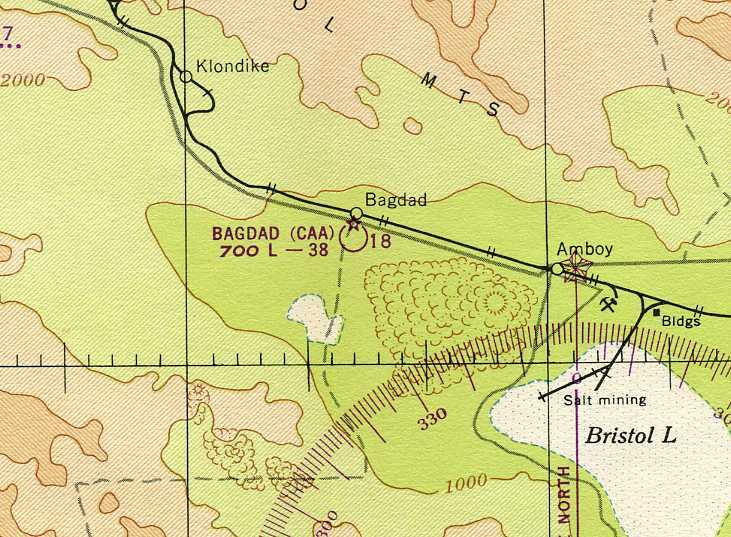 The 1945 Mojave AAF Aeronautical Chart depicted Bagdad as an auxiliary airfield. 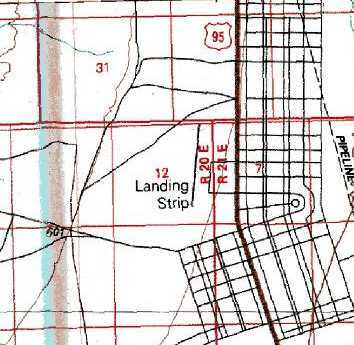 Bagdad Intermediate Field was listed among active airfields in the 1946 Haire Airport Directory (according to David Brooks). 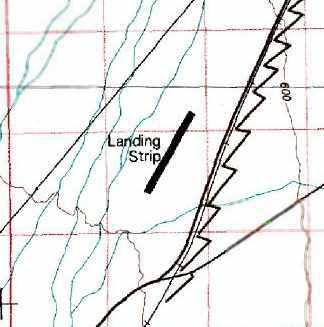 The February 1949 Sectional Chart (courtesy of Chris Kennedy) depicted “Bagdad (CAA)” as having a 3,800' unpaved runway. 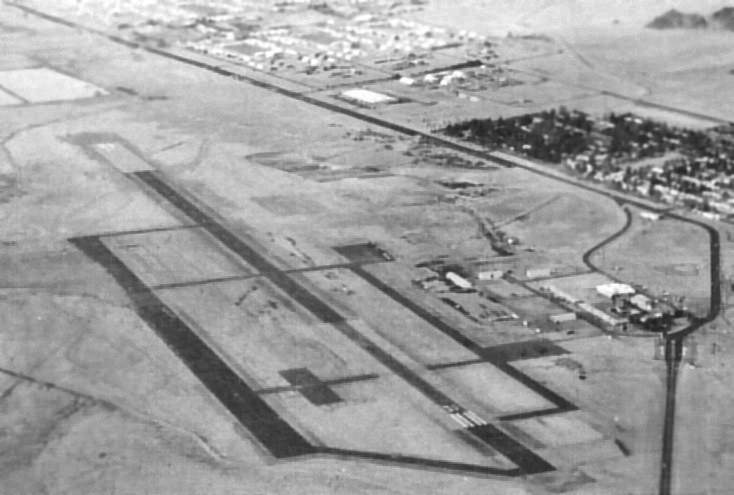 Bagdad Intermediate Field was listed among active airfields in the 1953 Aviation Week Airport Directory as a CAA Emergency Field (according to David Brooks). The Baddad Intermediate Field was not depicted at all on USGS topo maps from the 1950s, 1960s, or 1980s. was on the September 1954 Sectional Chart (courtesy of Chris Kennedy). 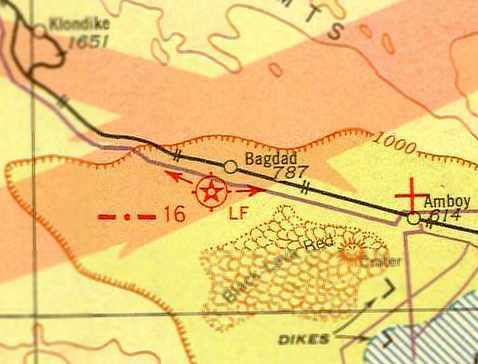 It depicted Bagdad as having a 3,800' unpaved runway. was on the 1955 Los Angeles Sectional Chart (according to David Brooks). 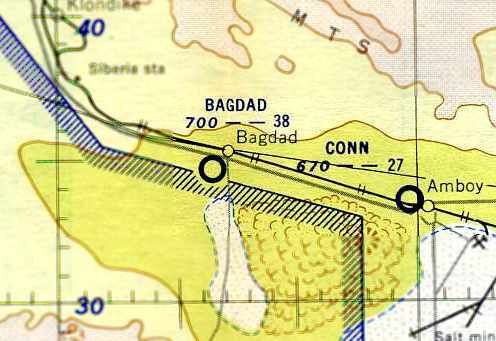 It depicted Bagdad as as an auxiliary field. as it was no longer depicted on the March 1958 Los Angeles Sectional Chart (according to Chris Kennedy). 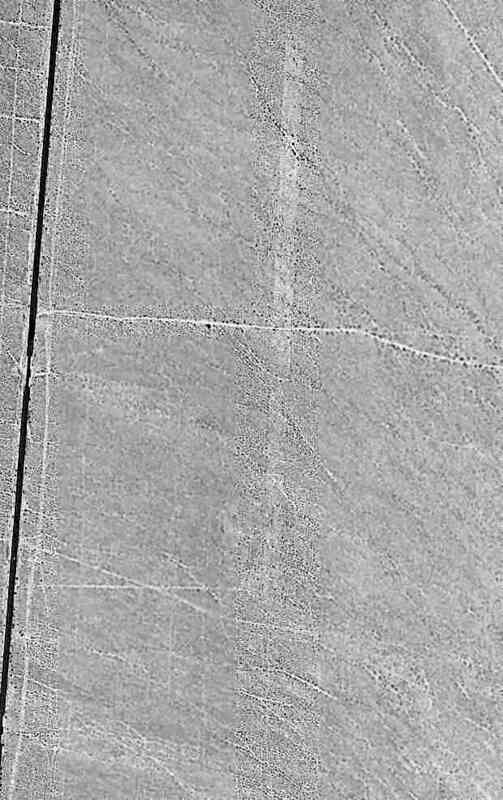 In the 1994 USGS aerial photo, the outlines of the Bagdad runways were still barely discernible. 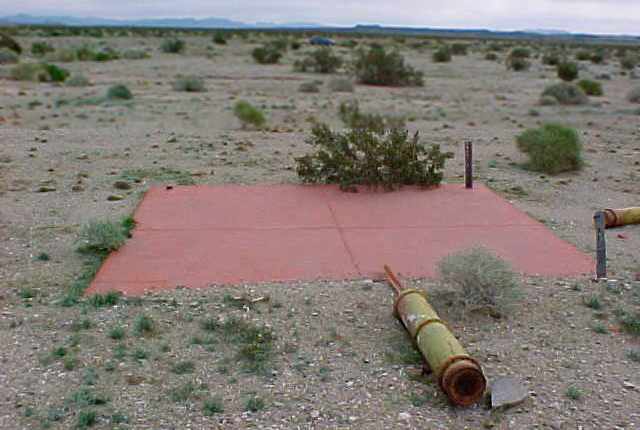 A 2008 photo by Charles Irvin looking east at the red painted base of the airway beacon tower that was adjacent to the airfield generator shed at the Bagdad Airfield site. 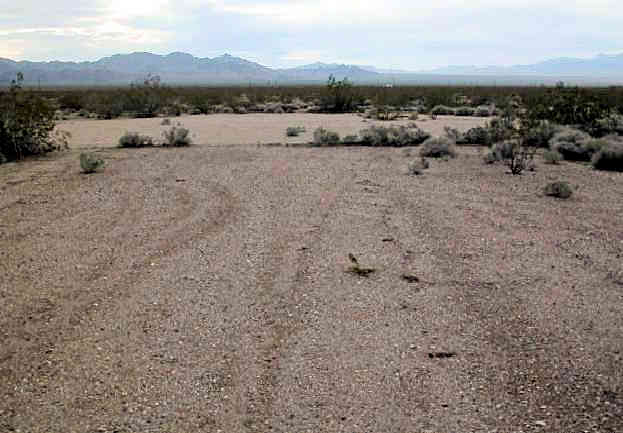 A 2008 photo by Charles Irvin looking along what was presumably the oiled runway surface at the Bagdad Airfield site. 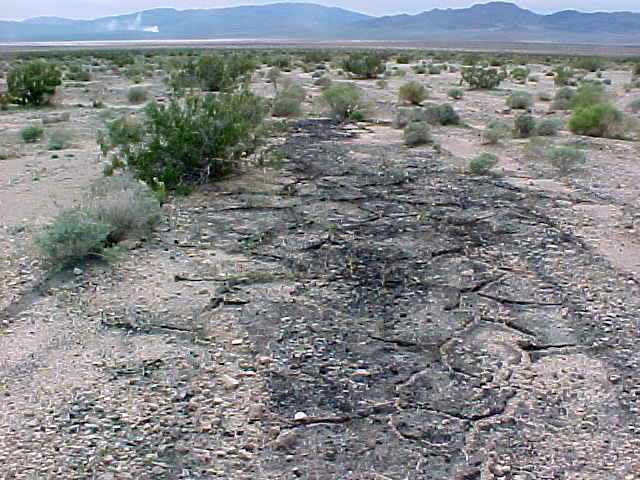 the oiled areas extend nearly right up to Old Route 66! It's basically a square oiled pad... can't tell by the satellite images (unless each runway was 300'+ wide!). and is buried in anywhere from an inch, to up to 2 feed of sand. that's why there's much less vegetation on the airfield area, than there is in the surrounding areas. and stops shy of the western boundary of the field. 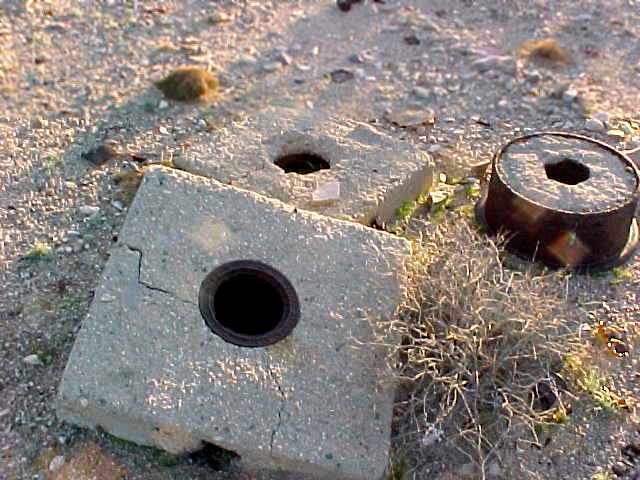 A 2008 photo by Charles Irvin of what were presumably connections to an underground fuel supply at the Bagdad Airfield site. 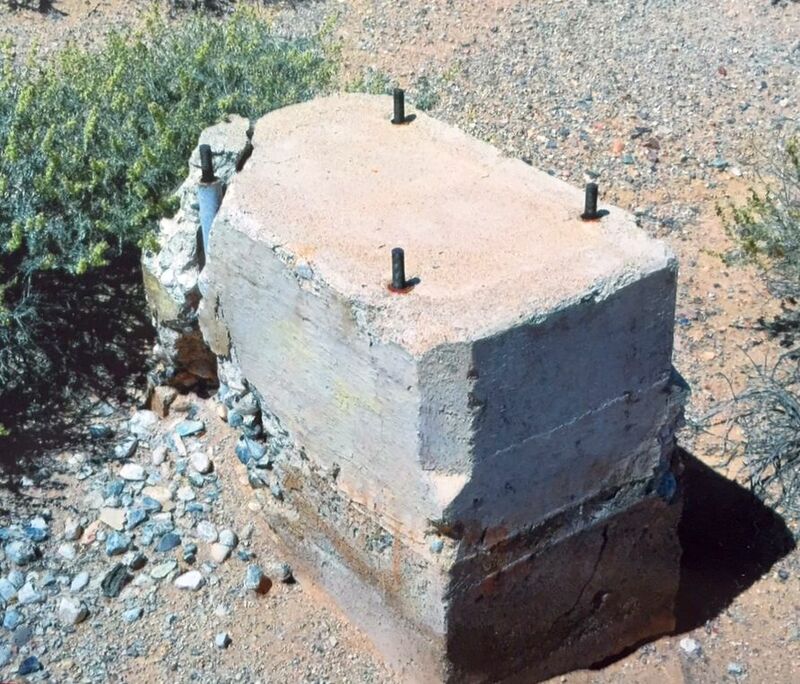 A 2008 photo by Charles Irvin of a USGS benchmark at the Bagdad Airfield site. 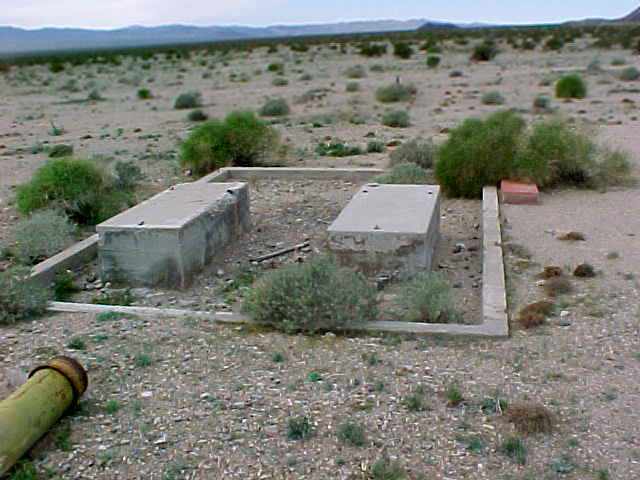 A 2008 photo by Charles Irvin looking west at what was presumably a generator stand at the Bagdad Airfield site. 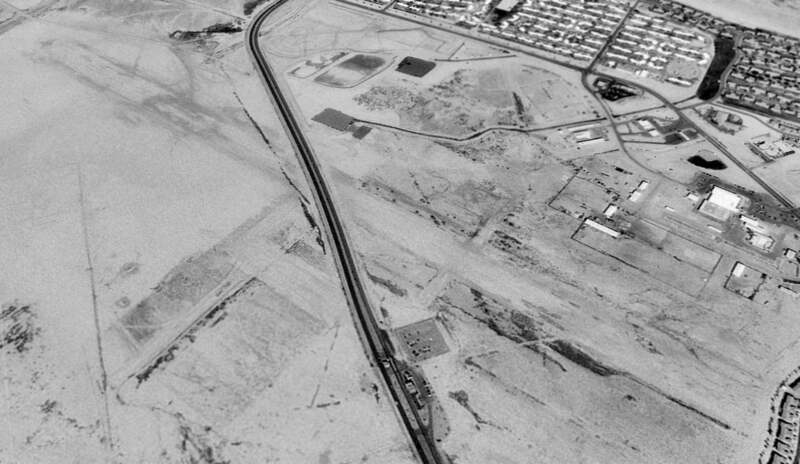 A 2013 aerial view showed the outlines of the Bagdad runways to remain recognizable. A 2/11/16 photo by Steve Owen looking south at the red-capped concrete pad which was the base of the airway beacon tower adjacent to the airfield generator shed at the site of Bagdad Intermediate Field. Steve observed, “I did not find much else, except the smoke on the mountainside is actually from Marine Corps bombing or artillery practice. 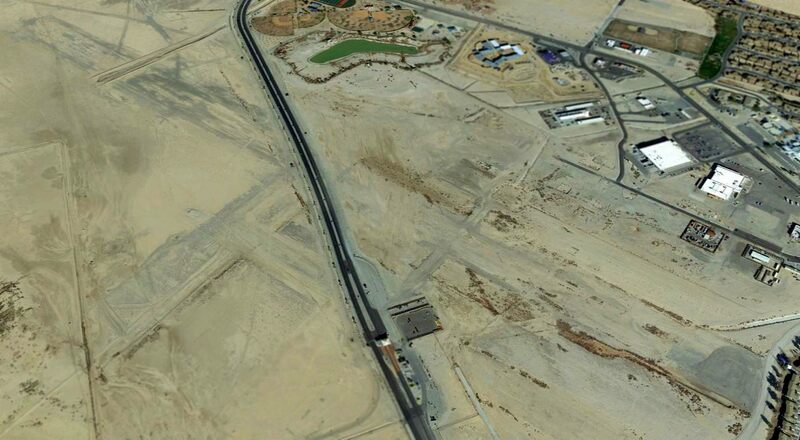 The site of the Bagdad Intermediate Field is located south of the intersection of National Trails Highway & Bagdad Way. The Goffs Airfield, as depicted on the 1932 Los Angeles Airway Chart (courtesy of Scott O'Donnell). An airfield was constructed at Goffs at some unknown date, prior to 1932.
with a rotating beacon light & course lights. The Goffs Intermediate Field was listed in The Airport Directory Company's 1933 Airports Directory (according to Chris Kennedy). described the Department of Commerce Intermediate Field at Goffs as "Site 21" along the LA-Amarillo airway. 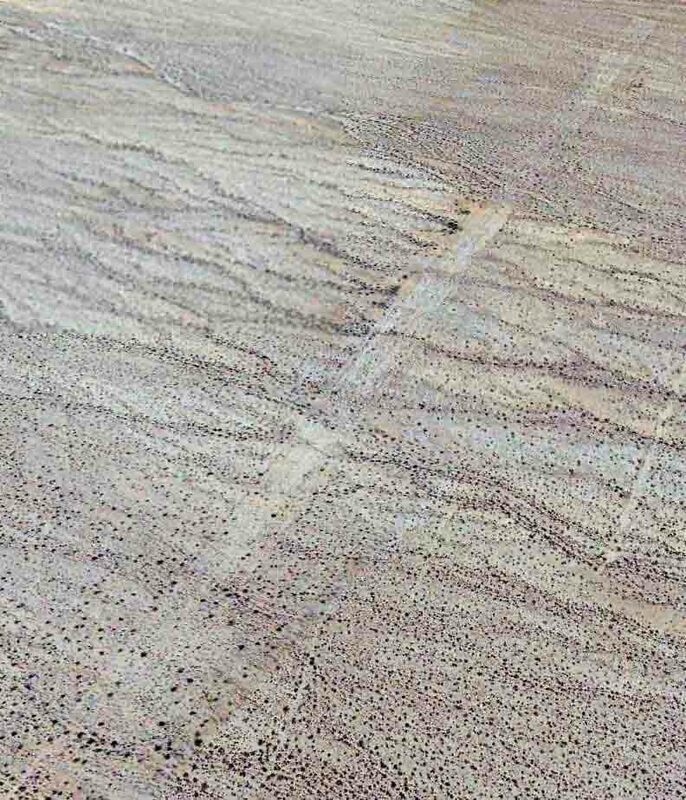 It was described as having 3 sod & dirt landing strips, with the longest being a 4,000' northeast/southwest strip. the Goffs emergency airport was dismantled & the equipment taken to Blythe the week of 4/30/37. The Goffs Intermediate Field was listed in The Airport Directory Company's 1938 Airports Directory (according to Chris Kennedy). nor in the 1945 AAF Airfield Directory (courtesy of Scott Murdock). The earliest photo which has been located of the Goffs Intermediate Field was a 4/23/53 USGS aerial view. 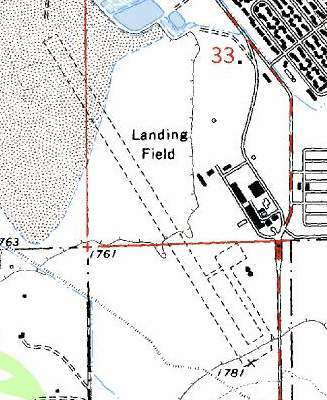 The 1956 USGS topo map depicted the irregular outline of the Goffs Intermediate Field, labeled simply as “Landing Strip”. 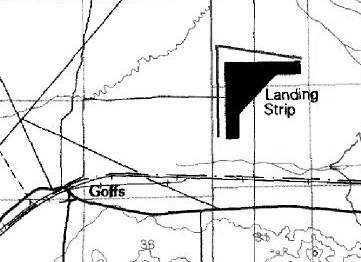 The 1985 USGS topo map (courtesy of Kevin Walsh) depicted the irregular outline of the Goffs Intermediate Field, labeled simply as “Landing Strip”. 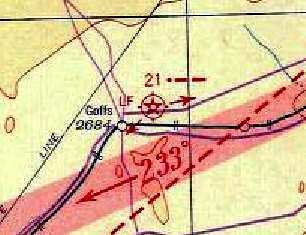 The Goffs airfield was not depicted at all (even as an abandoned airfield) on 2002 aeronautical charts. A 2003 photo by Chris Kennedy looking north at the remains of the Goffs airfield. Chris noted, "I didn't try to get to it because it is just too far off the main roads." A 5/17/12 aerial view by Chris Kennedy looking northeast at the remains of Goffs Intermediate Field, taken from a Bonanza. Chris reported, “It's very difficult to pick out the shape of the field from this angle though. The easiest feature to pick out is the diagonal just right of the center where there is a slight change in the growth on the ground. 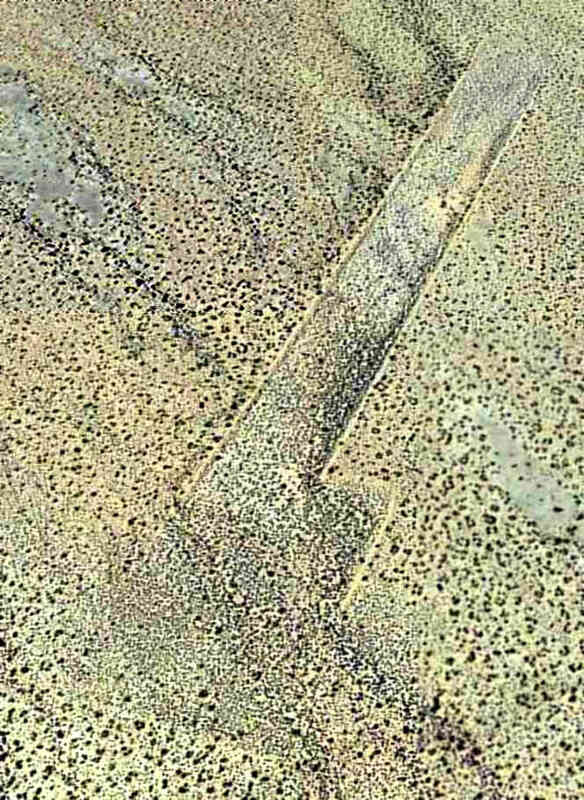 If you compare this photo to the [overhead] aerial, this line is the outside boundary of the diagonal runway. From there you can kind of work out the shape. In a 2014 aerial photo, the outlines of the runways & ramp area were just barely discernible. A March 2016 photo by Francis Blake at Goffs, of “Part of the compass rose in the northwest corner of the field. Small rocks had been painted white. 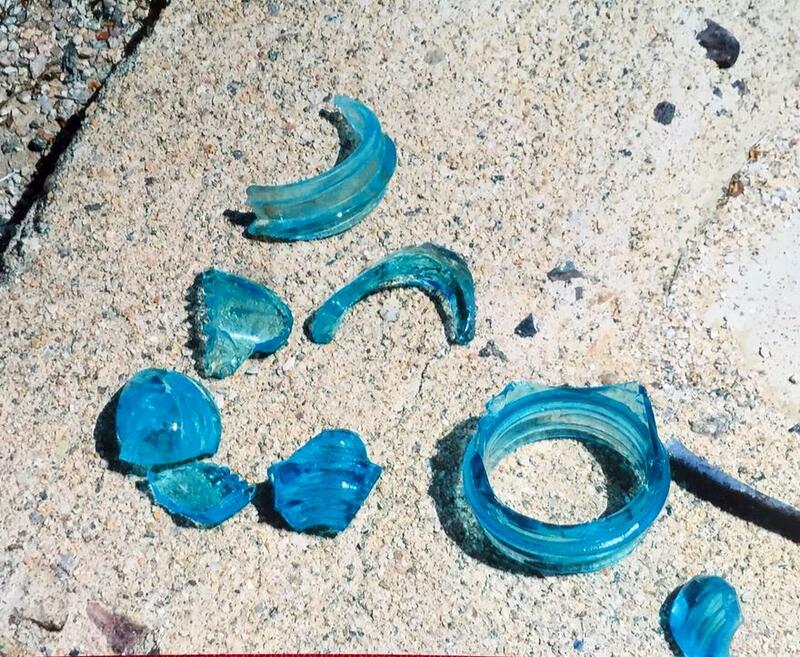 A March 2016 photo by Francis Blake at Goffs, of possible fragments of the airport beacon lens? The site of the Goffs Intermediate Field is located 2 miles northeast of the intersection of Route 66 & Goffs Road. 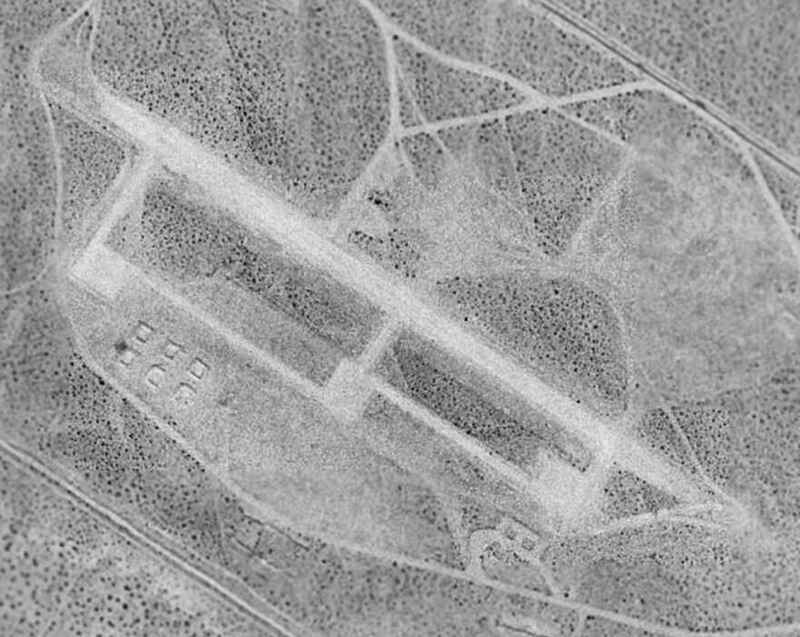 A 1995 USGS aerial view looking northeast at the remains of the Camp Goffs AAF runway. and adjacent to a 1930s alignment of US Route 66. The Goffs Campsite was established in 1942.
established to train the armored forces of General George Patton. the Goffs Campsite was a small, improvised field encampment. the Goffs Army Ammunition Depot #4, and the Goffs Rifle Range. about 2 miles to the east (Army Ground Forces 1943)." rather than reusing the much-larger former Goffs Intermediate Field, located only 2 miles to the east. Chris Kennedy supposed, “I doubt it was used by anything other than light liaison planes. Goffs was a small facility compared to the large camps like Coxcomb & Essex. 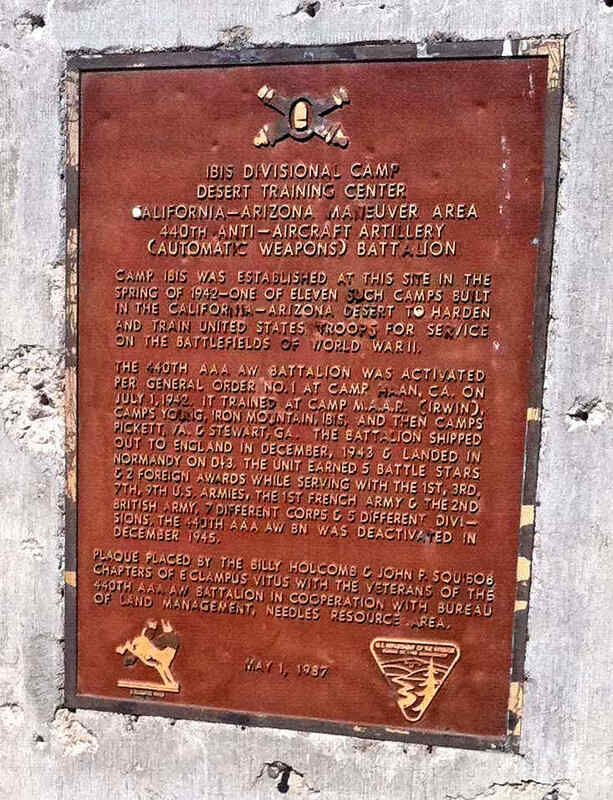 It was actually a quartermaster depot & not a camp according to the book I have about the California-Arizona Maneuver Area. The entire DTC was declared surplus in 1944. 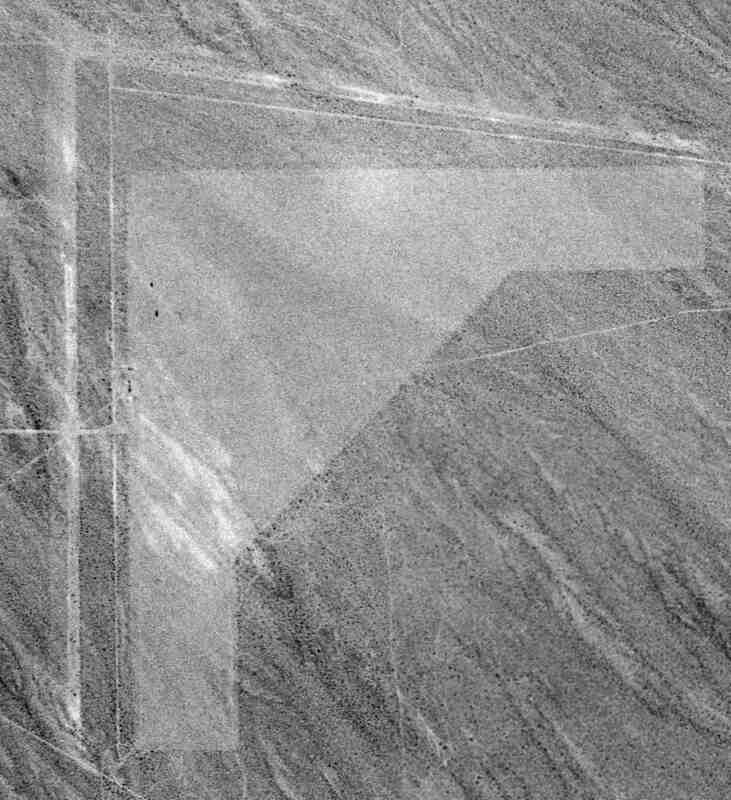 Nothing was depicted at the site of the Camp Goffs airfield on the 1956, 1975, or 1984 USGS topo maps. 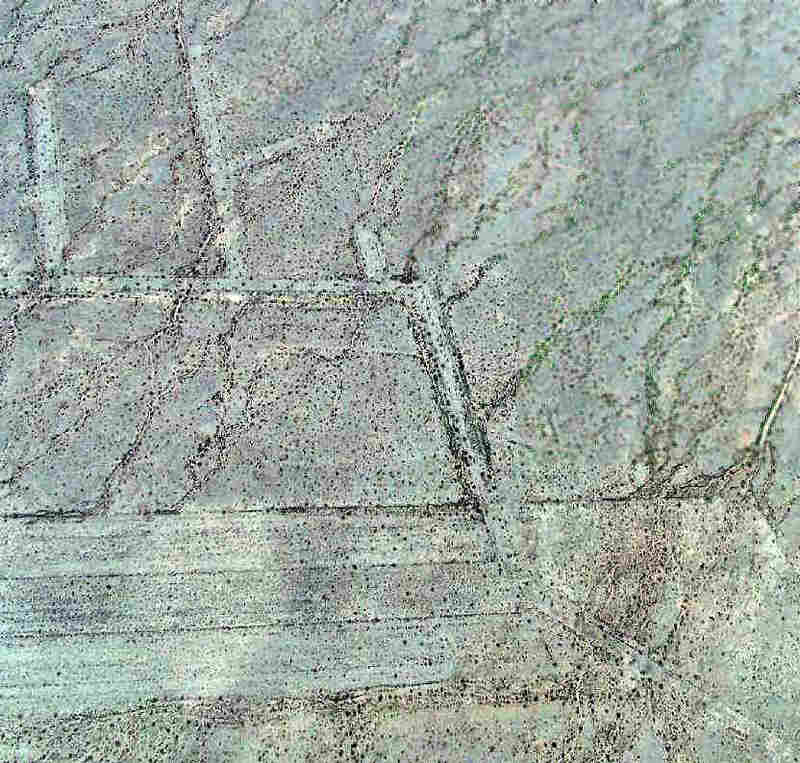 In the 1995 USGS aerial photo, the outlines of the single unpaved runway at Camp Goffs AAF was still recognizable. There was no sign of any buildings or other improvements associated with the airfield. A 2014 aerial view looking northeast showed the Camp Goffs AAF runway to remain recognizable. The Camp Goffs Airfield site is located 1 mile north of the the intersection of Route 66 & Goffs Road. A 1943 aerial view looking north at the Camp Ibis AAF (courtesy San Bernardino County Library, via Rick Jackson). as part of the 12 million acre Desert Training Center. 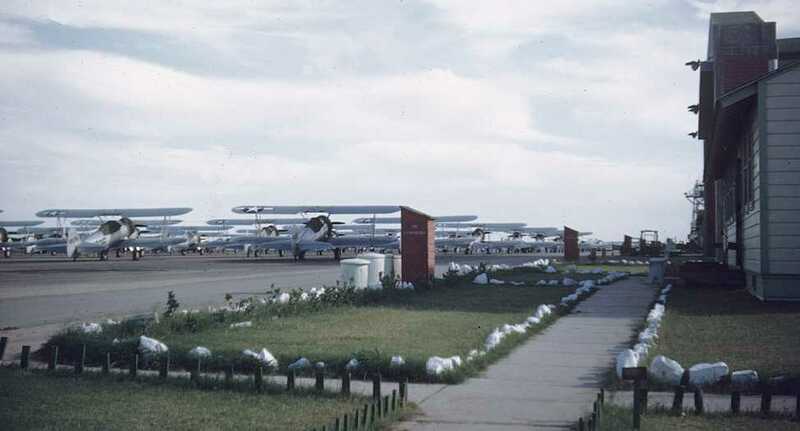 The airfield at Camp Ibis was built adjacent to the west side of the camp. 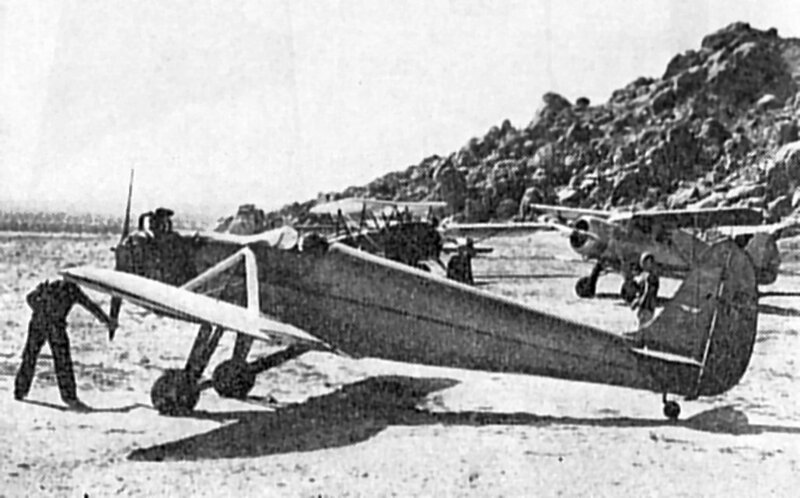 who was experimenting with the use of liaison aircraft to coordinate armored forces & motorized infantry. A 1943 aerial view looking east at the Camp Ibis AAF (courtesy San Bernardino County Library, via Rick Jackson). The Army Corps of Engineers history of Camp Ibis includes no mention of the airfield. The dates of construction & closure, and other specific history of the airfield are unknown. 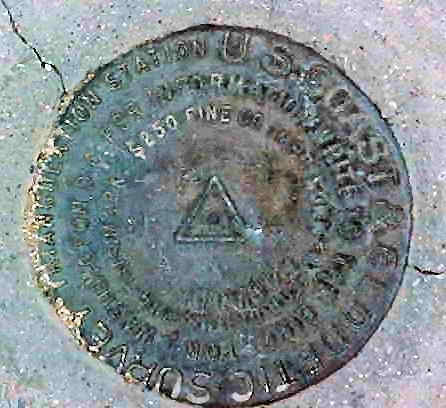 and was declared surplus in 1944.
nor on the 1956 or 1961 USGS topo maps. The airfield was depicted as consisting of a single 4,500' runway, oriented north/south. 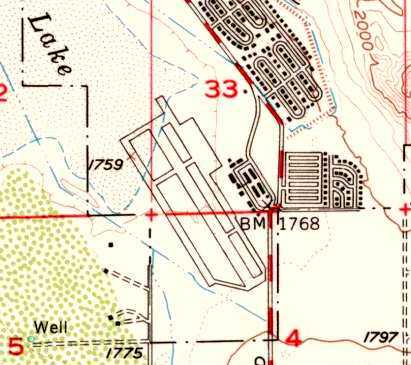 The Camp Ibis airfield was not depicted at all on the 1984 USGS topo map. A historical plaque commemorating Camp Ibis was installed on 5/1/87. Esther Miller visited Camp Ibis in 1997. She reported, "Most of Camp Ibis is on the east side of 95 but the airstrip was on the west side, parallel to the highway. It's another of those unpaved runways, with only slightly fewer plants than the surrounding area." A 2011 photo of a historical plaque erected on 5/1/87 commemorating Camp Ibis. A 2014 aerial view looking northwest showed the Camp Ibis runway was just barely recognizable. 2 miles north of Arrowhead Junction. 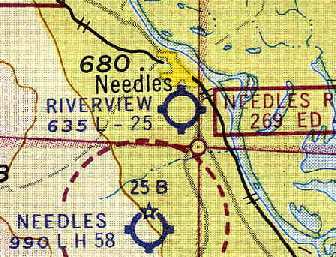 Riverview Airport, as depicted on the February 1947 Los Angeles Sectional Chart (courtesy of Chris Kennedy). 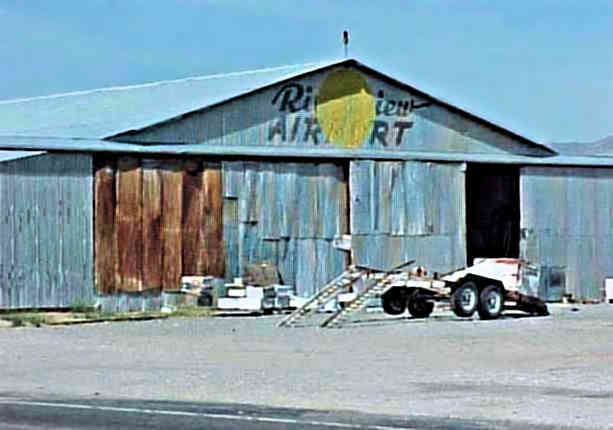 Riverview Airport was established in 1946.
was taken over during WW2 as Needles Army Airfield. was on the February 1947 Los Angeles Sectional Chart (courtesy of Chris Kennedy). 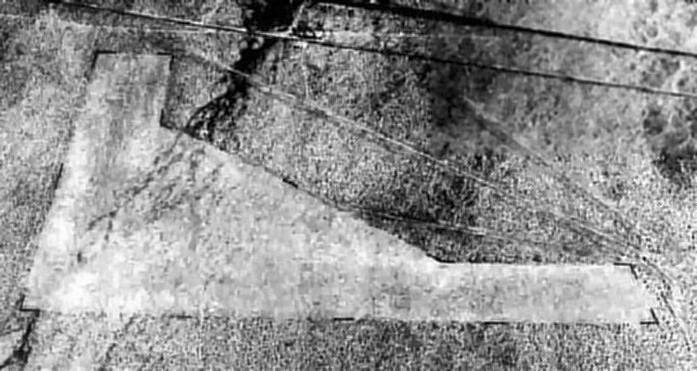 The earliest photo which has been located of Riverview Airport was a 10/31/47 USGS aerial view (enhanced by Bill Grasha). Two light aircraft were visible parked near a building on the east side of the unpaved runways. described Riverview as having a 2,700' unpaved runway. 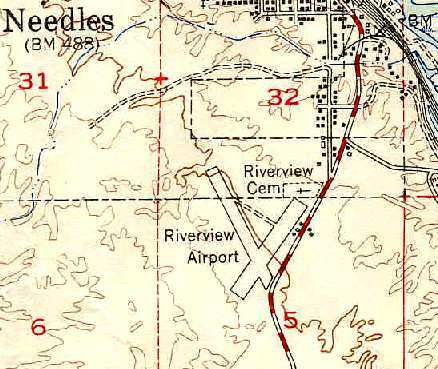 depicted Riverview Airport as being located adjacent to the west side of Route 95, one mile south of Needles. a connecting taxiway, and several small buildings (hangars?) in between the road & the northeast side of the airfield. 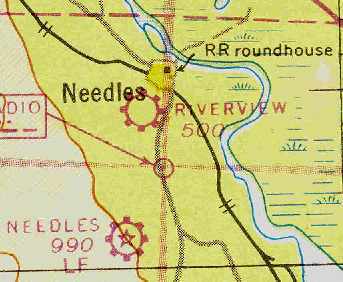 Riverview Airport, as depicted on the September 1960 Los Angeles Sectional Chart (courtesy of Chris Kennedy). described "Needles Riverview" as having 2 gravel runways: 2,600' Runway 2/20 & 2,300' Runway 14/32. The airport was listed as offering hangars, tiedowns, minor repairs, and charters. The operator was listed as Aileen Wilson, a Piper dealer. 2,665' Runway 2/20 & 2,300' Runway 14/32. A clusted of 3 buildings was depicted along the east side of the field. or on the 1969 USGS topo map. It was presumably closed due to competition from the larger facilities at Needles Municipal Airport (to the south). the former airport had been replaced by several new residential streets. A 5/11/04 photo by John Saunders (enhanced by Bill Grasha) looking southeast across the main runway at the remaining hangar at Riverview Airport. A 5/11/04 photo by John Saunders (enhanced by Bill Grasha) looking north across Route 66 at the remaining hangar at Riverview Airport. A 5/11/04 photo by John Saunders of "Riverview Needles Airport" still visible on the roof of the hangar. 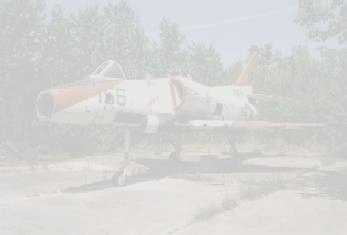 A 5/11/04 photo by John Saunders (enhanced by Bill Grasha) of "Riverview Airport" still visible on wall of the hangar. is a honey processing place for the local bee farms. I remember a lot of junk laying around, nothing reminiscent of airplanes. The place had shown its age though! I must say it is old & like the city of Needles, hasn't changed much." including the former hangar which still has “Riverview Airport Needles” painted on its roof. but the 2 hangars remained on the northeast portion of the site, along the west side of Route 95. 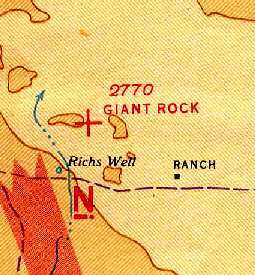 Giant Rock Airport, as depicted on the 1941 LA Sectional Chart (courtesy of Chris Kennedy). and built an underground home, hollowed out from beneath Giant Rock, in the early 1930s. wason the 1941 LA Sectional Chart (courtesy of Chris Kennedy). 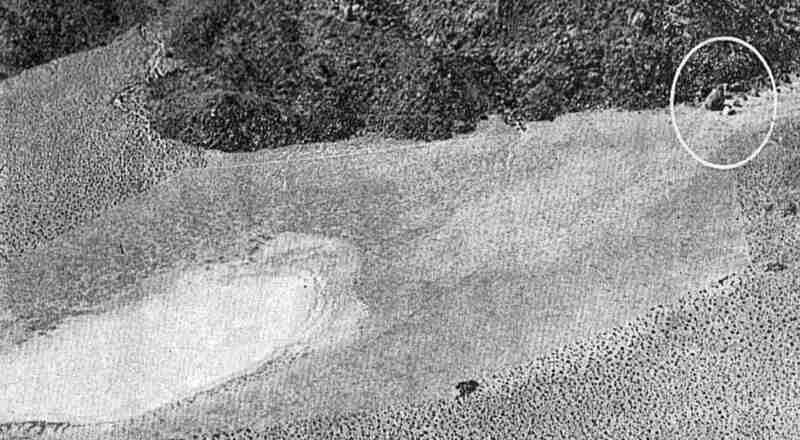 The earliest photo which has been located of Giant Rock Airport was an undated aerial view looking west from a 1942 magazine article (courtesy of Jim Geldert). 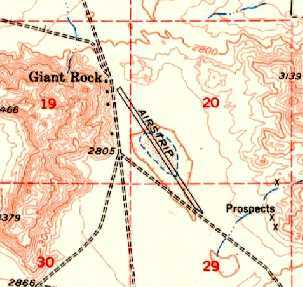 The namesake Giant Rock was circled on the right side of the photo, with the unpaved lakebed runway extending toward the bottom-left. from a 1942 magazine article (courtesy of Jim Geldert). who arrived to question him about a rumored affiliation with Nazis. unfortunately it was also where he stored dynamite used for mining ore & he was blown to pieces. it was probably the product of a small-town war-time hysterical reaction to his German surname. In the early 1940s, he introduced George Van Tassel to the Southern California desert scene. when the Van Tassel family moved onto the property. 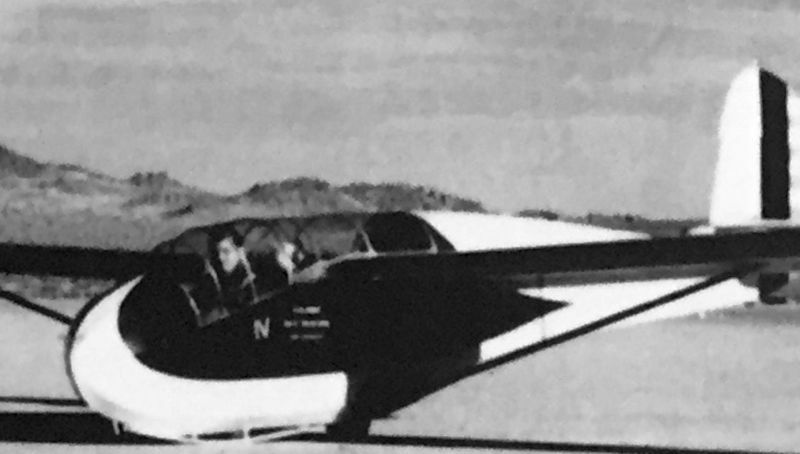 In 1947, George Van Tassel left his job as a Lockheed aircraft engineer & moved his family to the desert. He leased 4 square miles from the government, including Giant Rock. but they slept outside the Rock & during the day tended a small cafe they had set up. The makeshift runway built by Frank Critzer again became active at Giant Rock Airport. running a dude ranch & stopover point for weekend aviators. and wanted to make an airport here. Frank had already cleared an area & many airplanes had landed. However, it wasn't on the airmaps. Being of hard decomposed granite, it is a perfect natural runway. [that] we were able to move to Giant Rock." 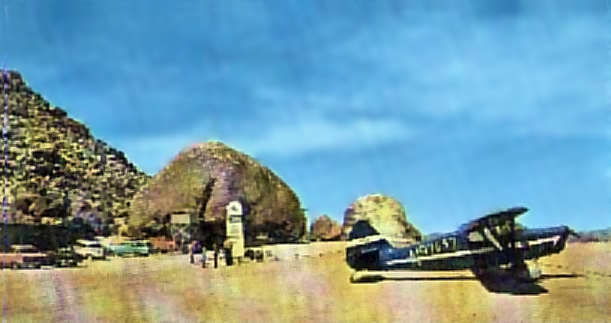 The last photo which has been located showing an aircraft at Giant Rock was an undated postcard looking northwest (courtesy of Steve Cruse) showing a single Piper taildragger. he began to receive psychic messages from extraterrestrial spaceship commanders. where he held conventions of UFO enthusiasts. Phil Du Bois recalled, "My parents visited the 'Giant Rock International Spaceport' in the 1950's. with some strange people about aliens, spacecraft, and other issues. My memories of Giant Rock are vivid, I believe the era was 1952-53, I was 12-13 years old. I was an airplane nut even then & spent much time at the 'spaceport'. During the 'Conventions' there were many people present & quite a number of airplanes (10-15 parked on the ramp)." Jim Long recalled, "My parents had a weekend cabin in Landers. it had a piano, wood stove, etc. It was a novelty, and a lost piece of my childhood." Lane Leonard recalled, “Van Tassel was a Dispatcher for American Airlines in LAX. My father knew him & we visited there a number of times. At first the stories were humorous & attracted people to the Airport. 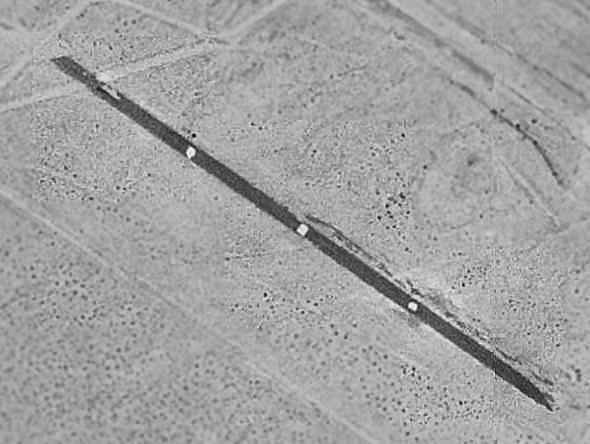 A 5/2/53 USGS aerial photo depicted Giant Rock as having a single northwest/southeast unpaved runway. described Giant Rock Airport as having 2 gravel runways, with the longest being 5,680'. Keith Wood recalled, "My dad flew us to Giant Rock once in about 1968 or 69. We ate at the café. We toured the house under the rock." Phil Du Bois recalled, "Many years later I became a pilot & Giant Rock was one of the 1st places I visited. I flew my Dad to the 'spaceport' in the fall of 1971. The runway was just as I remembered it from my childhood. 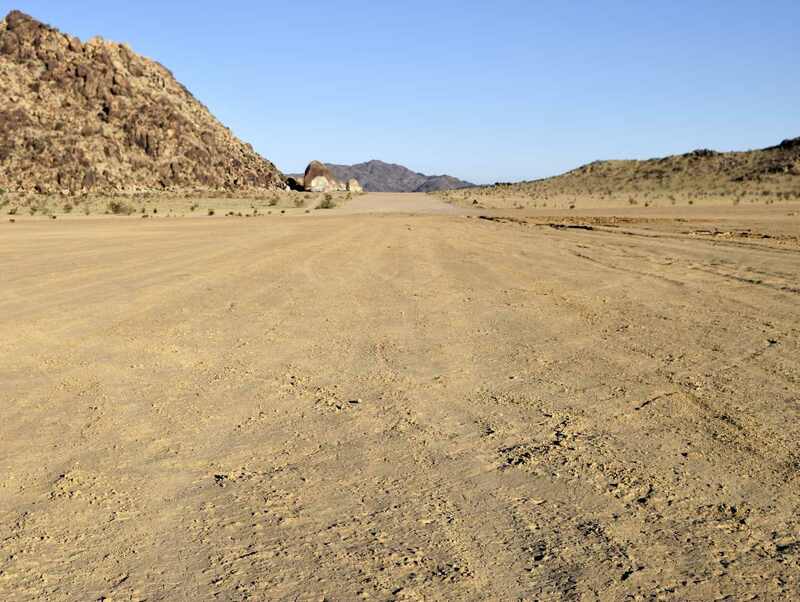 The center portion of the runway is actually a dry lakebed. 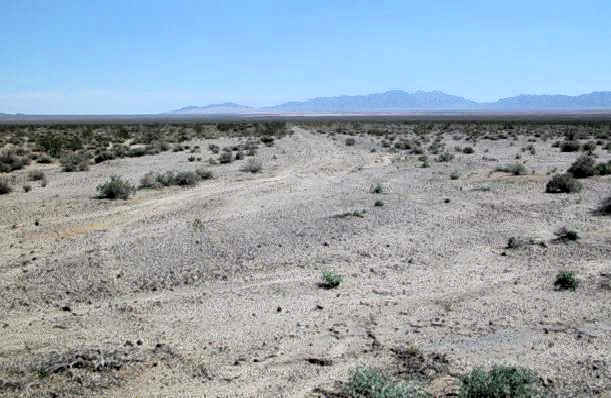 The runway was extended from either end of the dry lake with (decomposed granite). The runway was in excellent shape in 1971. We landed & were surprised to see a sort of restaurant still active on the grounds right next to the 'Rock'. All that was available was apple pie & soft drinks. Nevertheless, the visit was a memorable one." who in turn turned it over to Jose Rodriguez & his family in 1977." was on the July 1989 LA Sectional Chart (courtesy of Chris Kennedy). 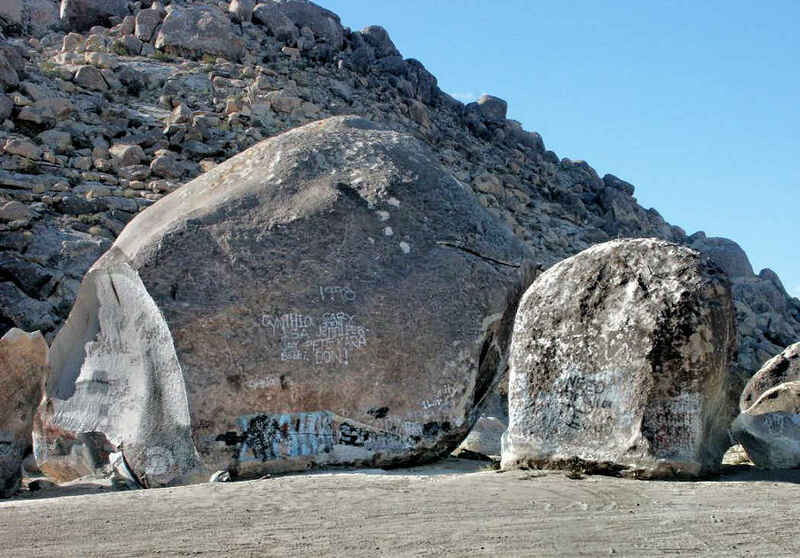 It depicted Giant Rock as a public-use airport having a 4,900' unpaved runway. 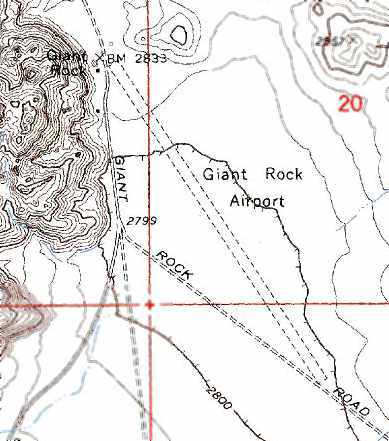 The 1991 USGS topo map depicted Giant Rock Airport as a having a single 5,200' unpaved runway. the unpaved runway was still in very good condition, but there was no sign of any recent aviation use. Phil Du Bois recalled, "I overflew the Giant Rock International Spaceport sometime in 1997. I dared not land this time. The runway was in ill-repair. No signs of life of any form appeared to me from 200 feet at 100 mph." A November 2004 photo by Tim Tyler looking west at Giant Rock. 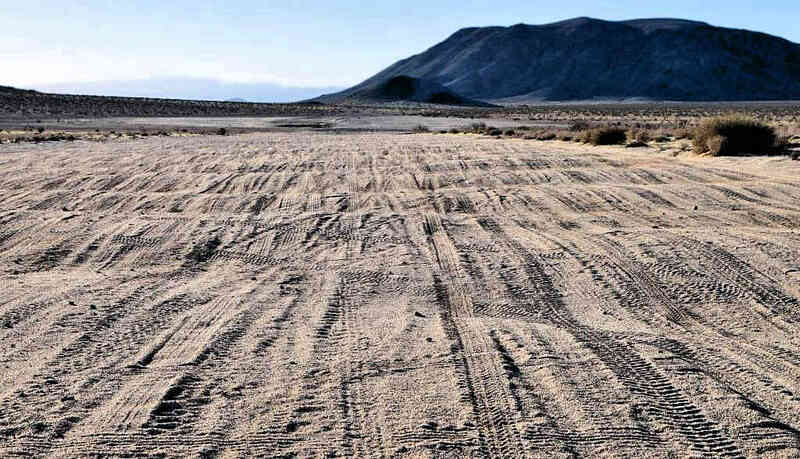 Tim reported, “It was a pretty rough & bumpy road to get out to the site, and it seems to be a popular area for hard-core off-road racing vehicles. A November 2004 photo by Tim Tyler looking east at a foundation at Giant Rock. and if you knew a little about the history of the grounds & looked around, you could find the foundation remains of several structures. A 10/30/15 photo by Kurtis Clark looking northwest along the Giant Rock runway. A 10/30/15 photo by Kurtis Clark (enhanced by Bill Grasha) looking southeast along the Giant Rock runway. Kurtis reported, “Years of neglect have left the surface unsafe for landing a plane. 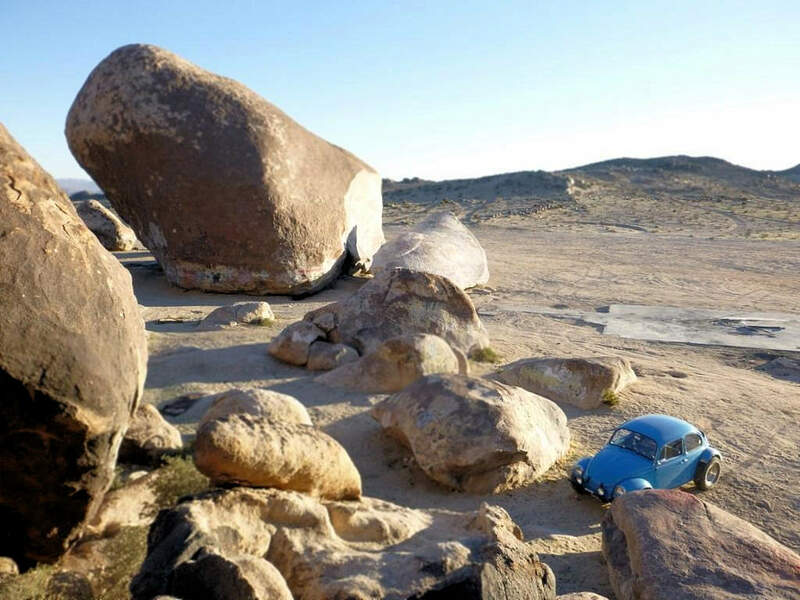 A 10/30/15 photo by Kurtis Clark looking north at Giant Rock & Kurtis' off-road VW Beetle. 16 miles north of Yucca Valley. 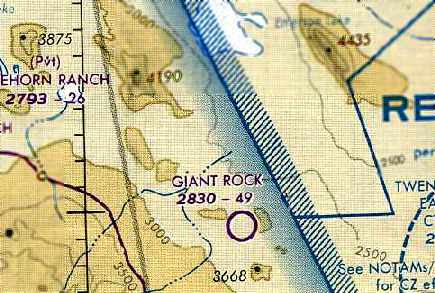 Thanks to Steve Cruse for pointing out Giant Rock Airport. 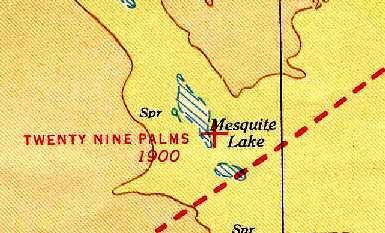 Twenty Nine Palms Airfield, as depicted on the 1941 LA Sectional Chart (courtesy of Chris Kennedy). its original military airfield is now barely evident. in what is now the Mainside area of the Twentynine Palms Base. 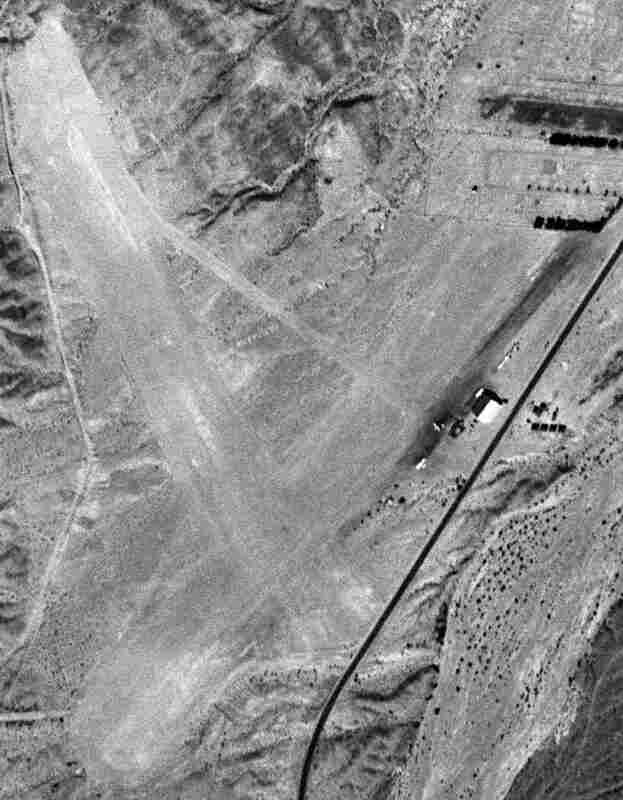 The date of construction of this airfield has not been determined. on the 1941 LA Sectional Chart (courtesy of Chris Kennedy). which was established to serve as the primary Army glider school of WW2. 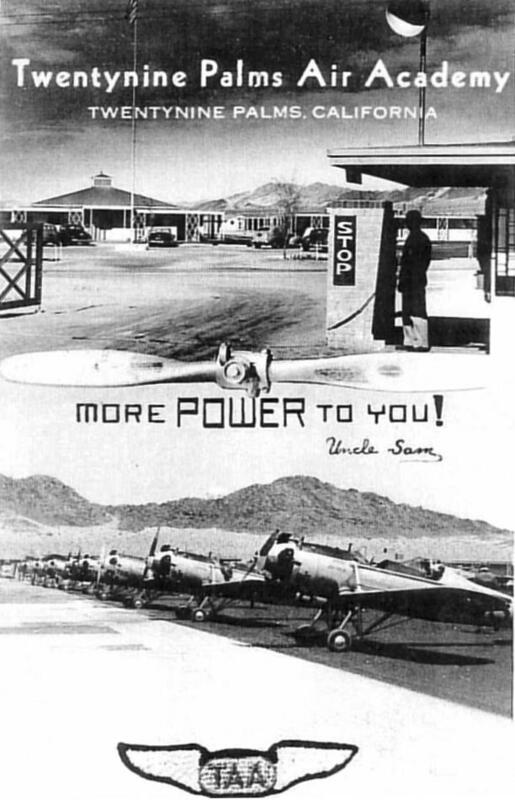 from a brochure for the “Twentynine Palms Air Academy, Contractor to the USAAF” (courtesy of Joe Matoush). at the Twentynine Palms Air Academy at Condor Field (courtesy of Joe Matoush). 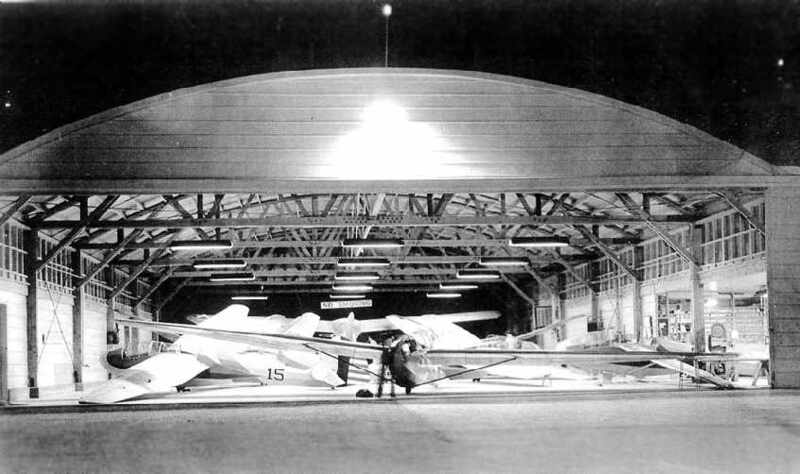 An undated (but presumably also 1942) photo of Schweizer TG-2s gliders inside a hangar at Condor Field (courtesy of Joe Matoush). 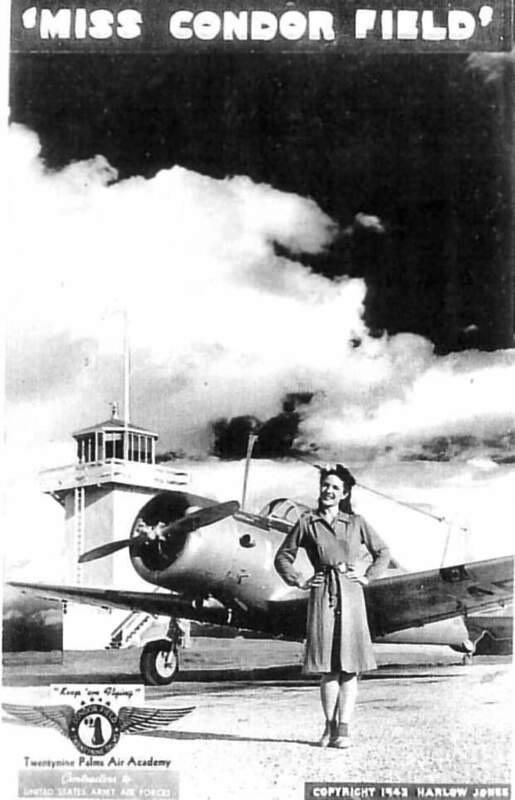 An undated (but presumably also 1942) photo of a hangar with attached control tower at Condor Field (courtesy of Joe Matoush). 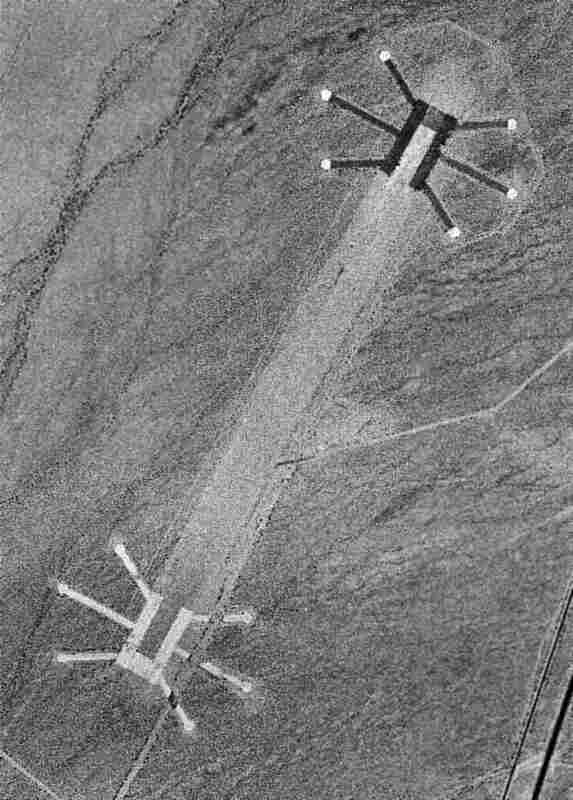 The Twentynine Palms Airport (6 miles east) was also used as an auxiliary glider airport by Condor Field during WW2. A WW2-era photo Roland Bauman (from the Collection of Clark Bauman) of Stearman trainers on the Condor Field ramp. A WW2-era photo by Roland Bauman (from the Collection of Clark Bauman) of a Vultee BT-13 trainer at Condor Field. 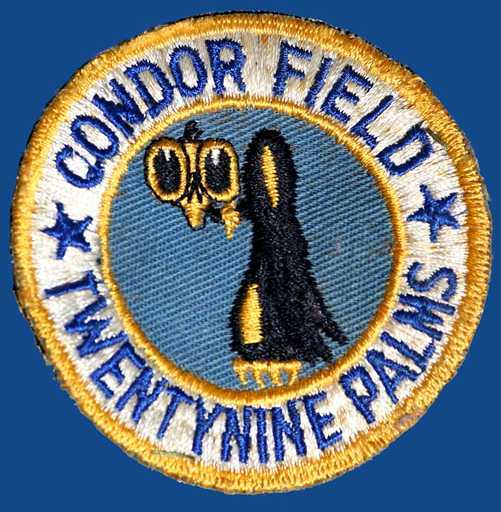 A WW2-era patch of Condor Field (from the Collection of Clark Bauman). 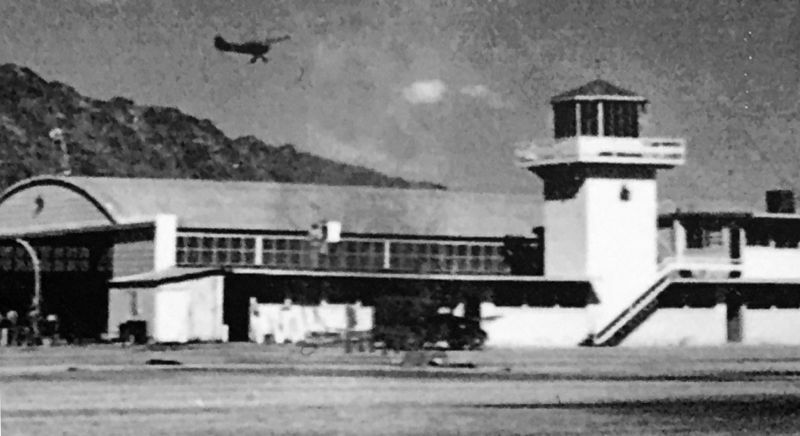 A WW2 photo of a Piper Cub overflying a Condor Field hangar & its control tower. A WW2 photo of a glider (model unidentified) at Condor Field. 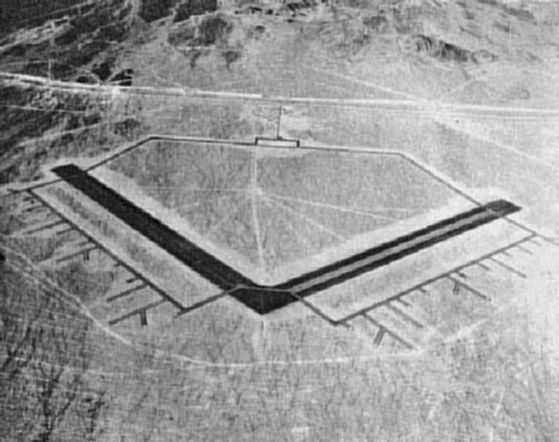 depicted “Twenty-Nine Palms Naval Auxiliary Air Station (Condor Field)” as having 2 oiled runways. A WW2 photo of a CG-4A glider at Condor Field, with several P-38 Lightning fighters in the background. and the Army closed their operation at the field. but the remarks said "Closed". It was described as having a 3,000' runway. and was redesignated Twentynine Palms Naval Auxiliary Air Station. 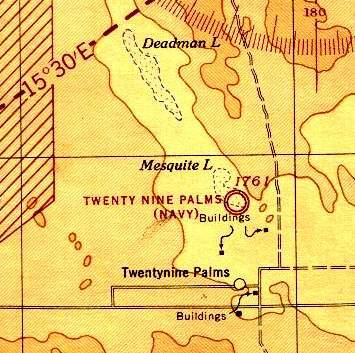 It was labeled as "Twentynine Palms (Navy)" on the 1944 LA Sectional Chart (courtesy of John Voss). along with a 8,000' x 2,500' dry lake bed all-way landing area. The field was said to have 2 wooden hangars, the largest being 200' x 151'. 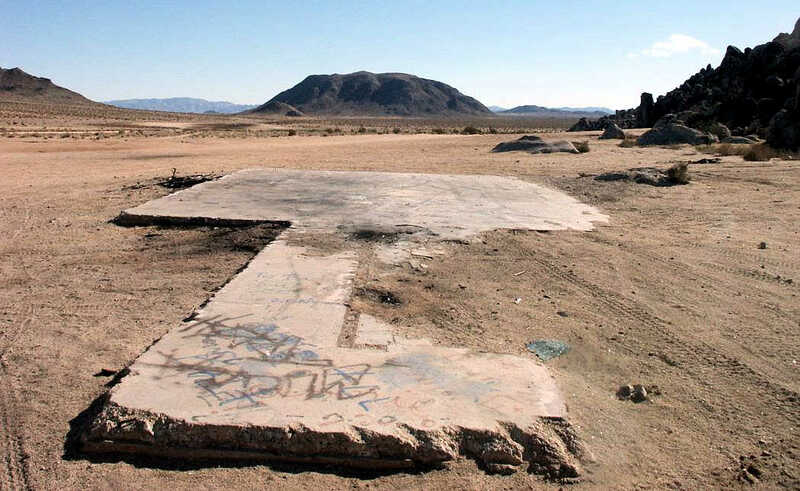 Twentynine Palms Naval Auxiliary Air Station was abandoned by the Navy in October 1945. At some point between 1945-49, the field was reopened as a civil airport. That is how "Twentynine Palms" was depicted on the 1949 Los Angeles Sectional Chart (according to Chris Kennedy). It was described as having a 4,000' hard-surface runway. In 1952, as part of the Korean War buildup, a need was identified for more expansive ranges to support live-fire training. 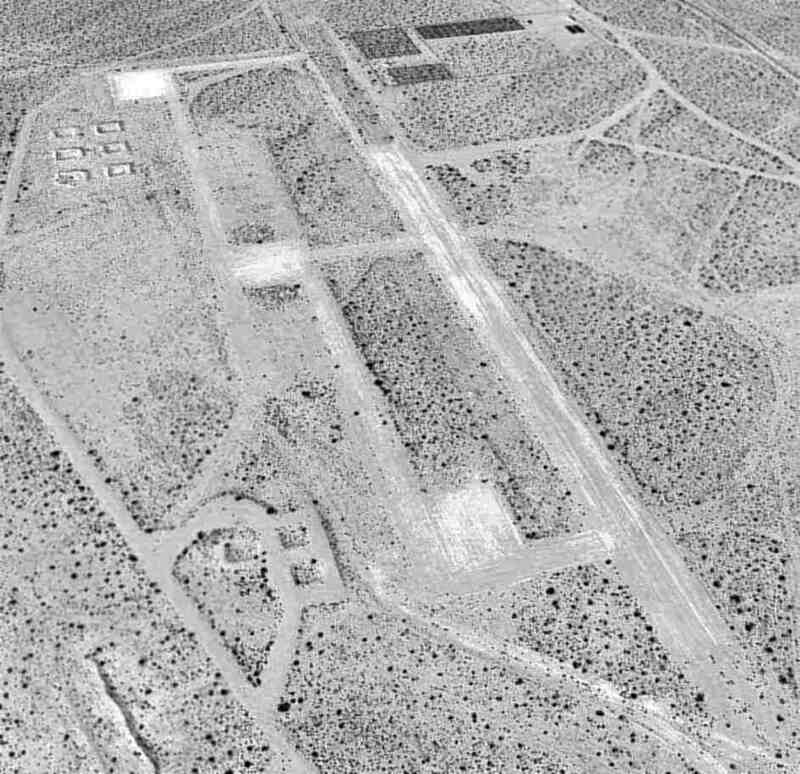 and the Marine Corps Training Center Twentynine Palms was established on the site of Condor Field. 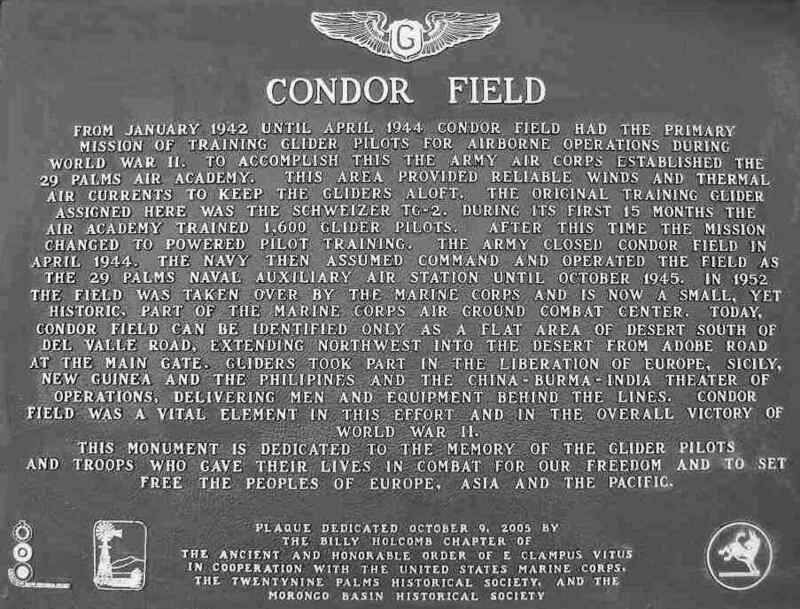 The airfield at the former Condor Field was expanded as an expeditionary airfield. and a number of buildings on the east side of the field, but it was not labeled at all. with the longest runway being a 6,000' steel mat. An undated (circa 1960s?) 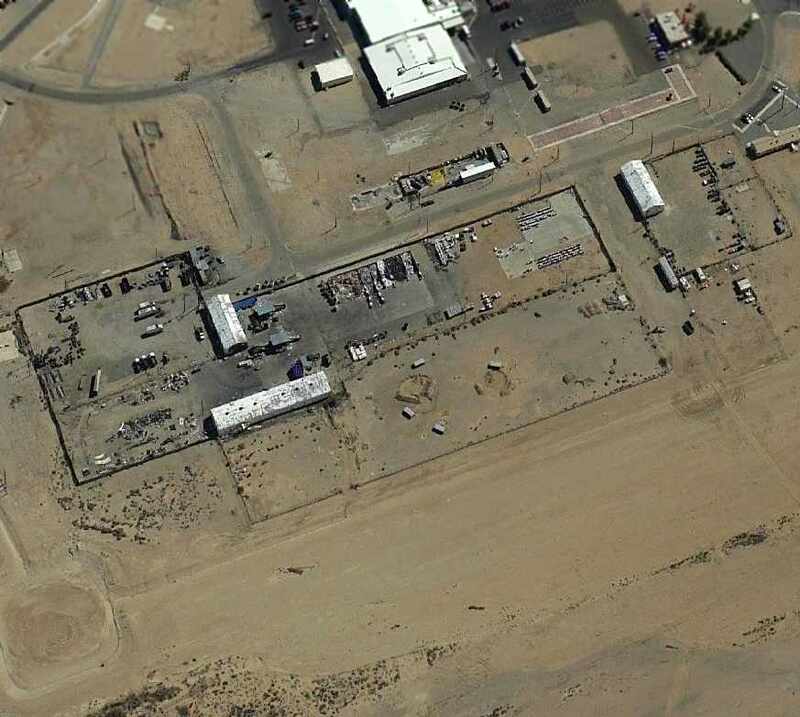 aerial view looking west at Condor Field (courtesy of MCAGCC Twentynine Palms MWSS-374 CWO2 John Lackie). taken only 2 years before it was replaced by a newer airfield. Note that the large WW2-era hangar visible in the preceding 1960s photo had been removed at some point prior to 1974.
capable of handling any aircraft up to & including the giant C-5 Galaxy transport. The new airfield was built 8 miles northwest of the original airfield. according to MCAGCC Twentynine Palms MWSS-374 CWO2 John Lackie. running parallel to the west of the primary runway. and having a ramp area at the southeast corner. 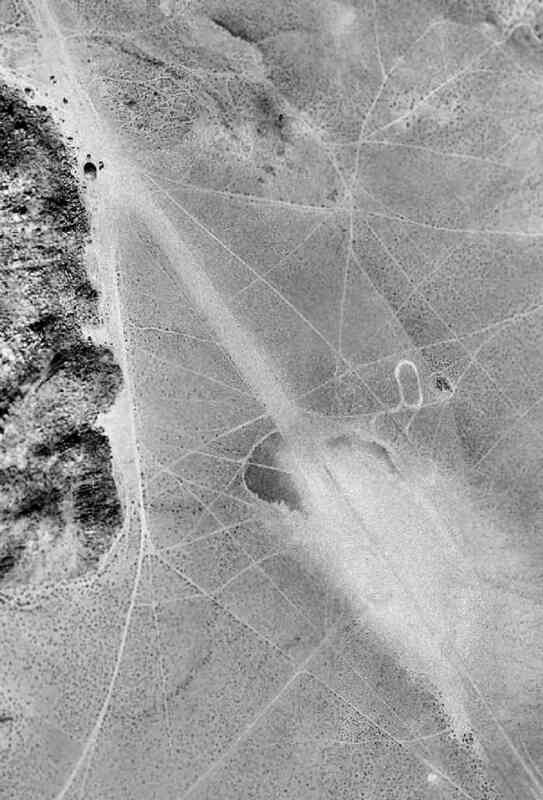 A 1995 USGS aerial view looking northeast showed the faint outlines of the 2 runways that remained at the site of Condor Field. A new road had been built through the center of the former runway. and had the advent to walk out onto the remains of the runway. and once in a blue moon for helicopters (CH-46s & CH-53s). Peter Hantelman reported in 2006, “I was in CA this summer , stationed at Twentynine Palms Marine Corps Base. I lived for 4 months on the trailer park - which was not a few hundred feet from the end of the old runway! and I couldn't make sense of it at the time. A January 2006 photo of a historical plaque which was dedicated on 10/9/05 at the site of Condor Field (courtesy of Chris Kennedy). shows several buildings which appear to remain from the WW2 airfield. but the former airfield buildings had been scraped away. west of the intersection of Condor Road & Cottontail Road. USGS aerial photo 1989 (enhanced by Bill Grasha). sits a complex of 3 airfields, one of which is still used to operate unmanned aerial vehicles. The date of construction for these airfields is unknown. None of them were depicted on USGS topo maps from the 1950s, 1960s, 1970s, or 1990s. who posthumously received the Navy Cross for gallantry during the Grenada invasion. The airfield is operated by Marine Unmanned Aerial Vehicle Squadron 1, "The Watchdogs". to provide aerial reconnaissance support to the Marine Air Ground Task Force. & provides ground commanders with flexible, on-call intelligence support. that provide high-quality imagery both day & night. and its Marines are actively involved in the operational testing & evaluation of the next generation of UAVs. which is home-based at MCAS Miramar. 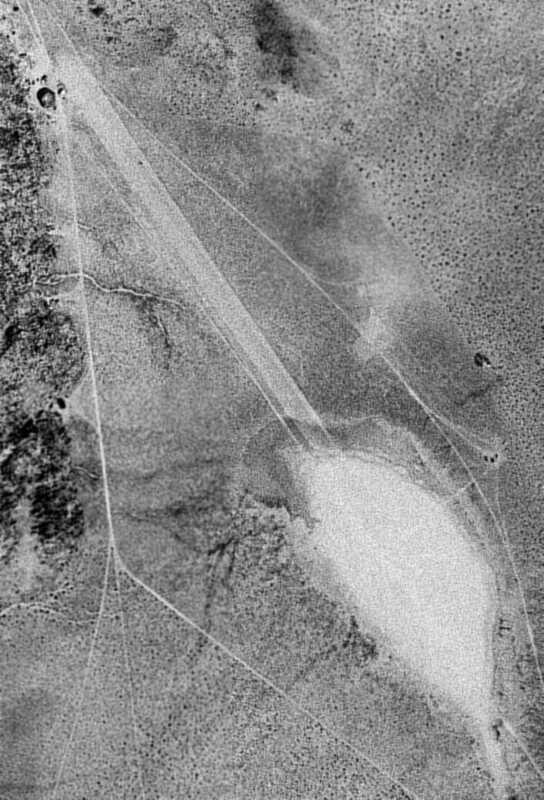 The 1989 USGS aerial photo above shows that there are actually 3 separate runways at the site of MCOLF Seagle. oriented northwest/southeast, which is bisected by Coyote Valley Road. or it may be a much older strip (WW2 era?) which is abandoned. 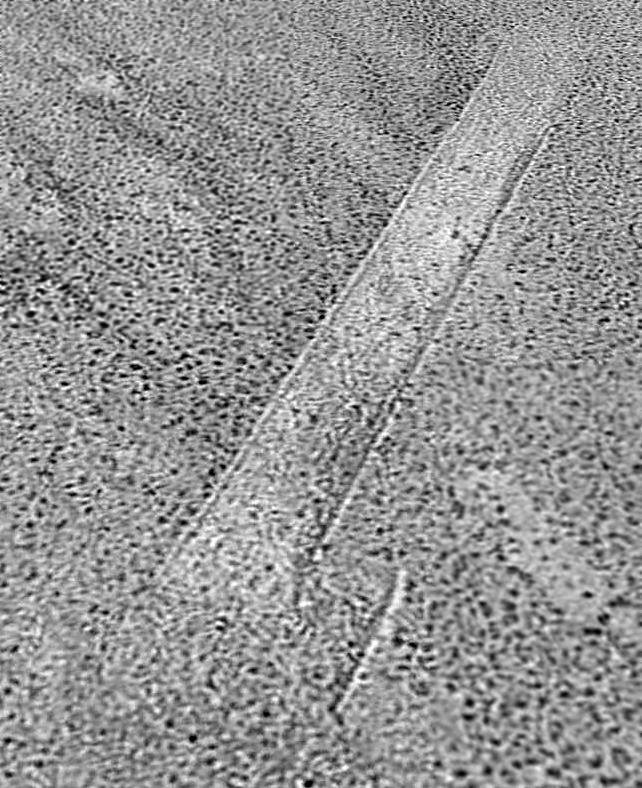 A close-up from the 1989 USGS aerial photo (enhanced by Bill Grasha) of the southeastern runway at Seagle. The southeastern runway is a 2,000' asphalt strip, which runs to the southeast away from Coyote Valley Road. 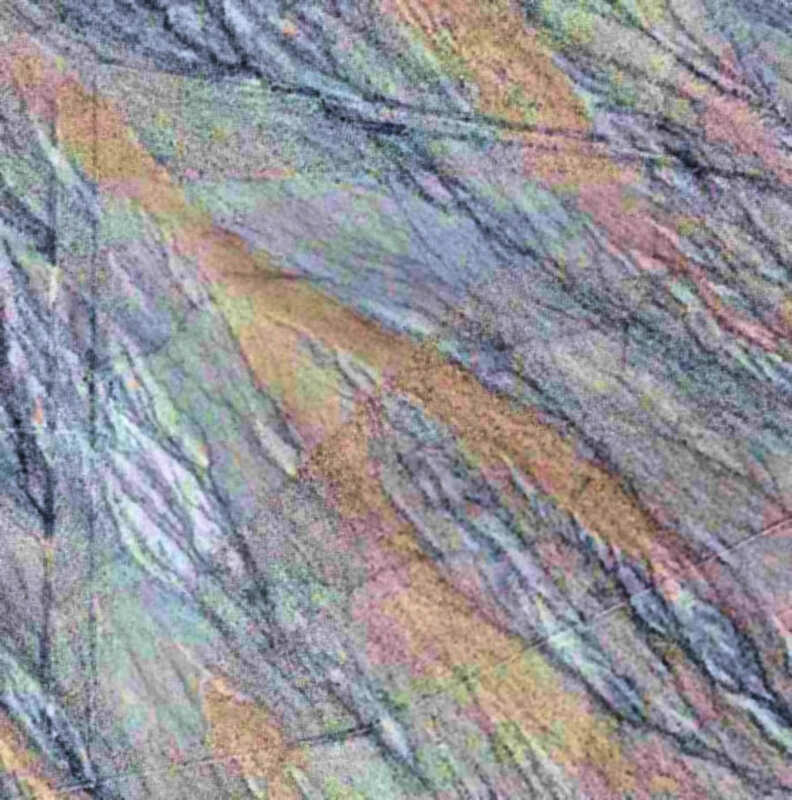 It has some markings painted on the runway, which can not be discerned in the above photo. The purpose of this runway is unknown. 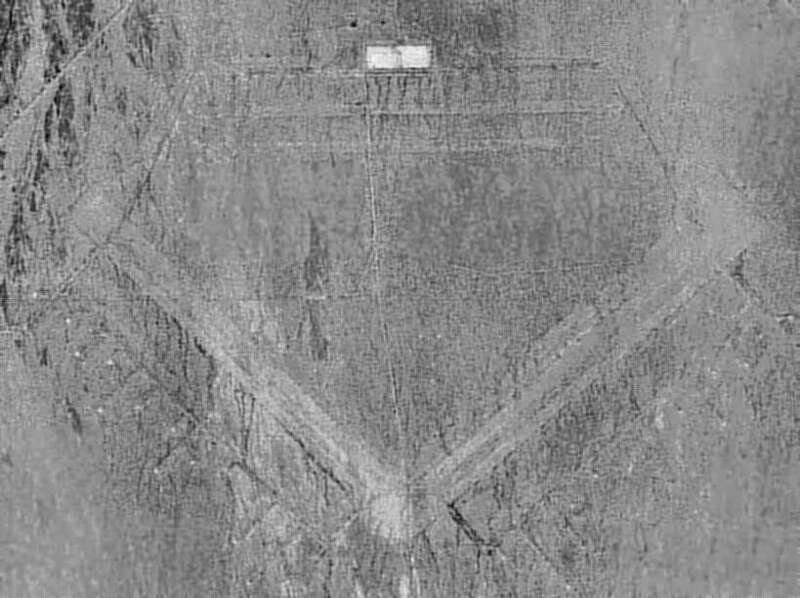 A close-up from the 1989 USGS aerial photo of the southwestern runway at Seagle. The southwestern runway is the one which apparently is used as the UAV facility. and is marked at either end with closed runway "X" symbols. It has a small asphalt ramp area north of the middle of the runway. There do not appear to be any buildings at any of the 3 runways. marked with X's & unsafe for all aircraft operations." Strangely, though, Seagle MCOLF itself is not listed at all in the AFD or on aeronautical charts as an active airfield. Apparently, if it is used only by unmanned aerial vehicles it does not have to be listed. so apparently there is no concern about other air traffic blundering into the area. A 5/27/12 aerial view looking northwest at the 3 Seagle runways (enhanced by Bill Grasha). A 10/30/15 photo by Kurtis Clark looking northeast at Seagle MCOLF. Kurtis reported, “The near building is at Seagle. The distant 2 buildings are at the current 29 Palms” Marine Corps Expeditionary Airfield. 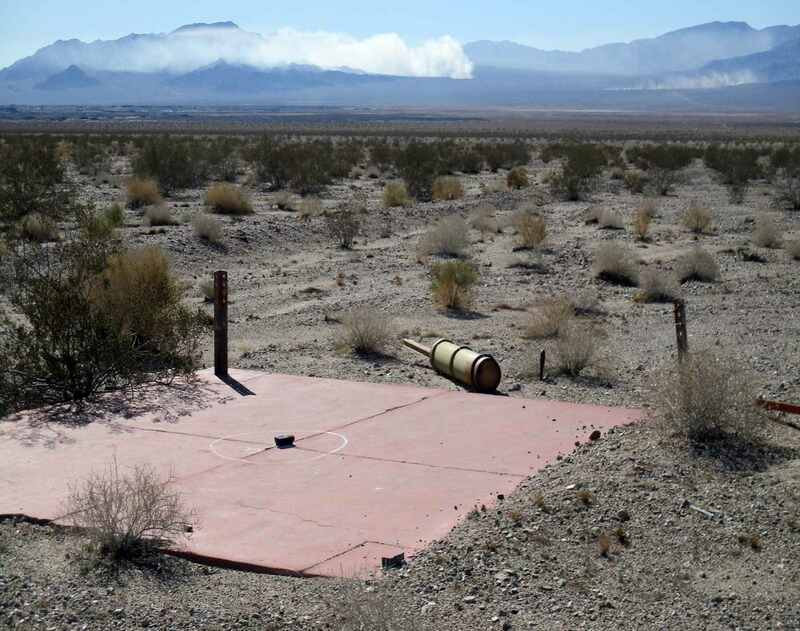 2 miles southwest of the primary Twentynine Palms Expeditionary Airfield. A 1987 aerial photo looking west along Surprise Spring's Runway 29 (courtesy of CWO2 John Lackie). 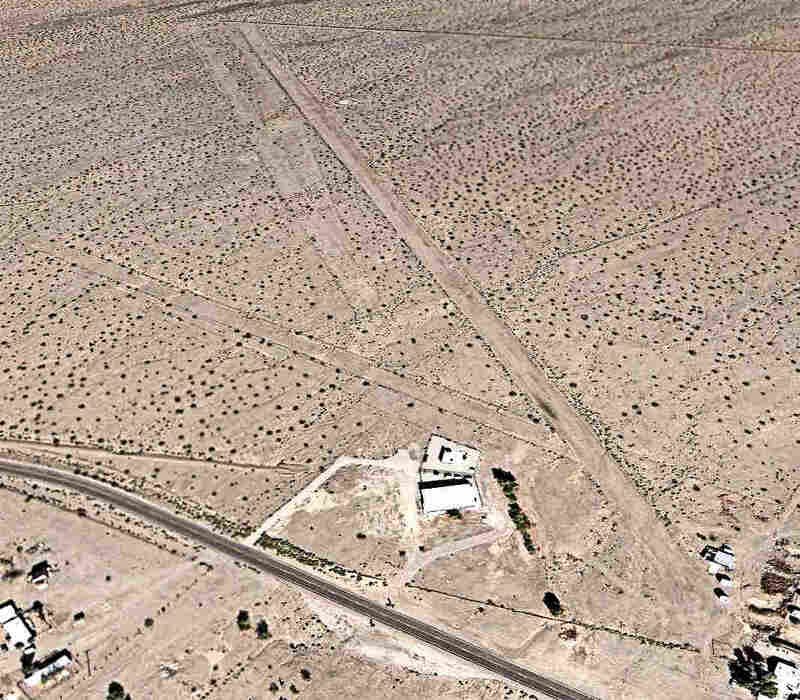 This military airstrip sits in the desert 6 miles west of the primary Twentynine Palms Expeditionary Airfield. The airfield was not yet depicted on the 1982 USGS topo map. the Marine Corps began operating the Expeditionary Vertical Short Take-off & Landing field in 1985. It consisted of a 2,000' AM-2 airfield matting runway, along with a taxiway & parking ramps, and 6 refueling berms. Surprise Springs served AV-8B Harriers & Marine helicopters. was a 1987 aerial photo (courtesy of CWO2 John Lackie). along with a parallel taxiway on the southwest side, along with 4 square ramp areas. 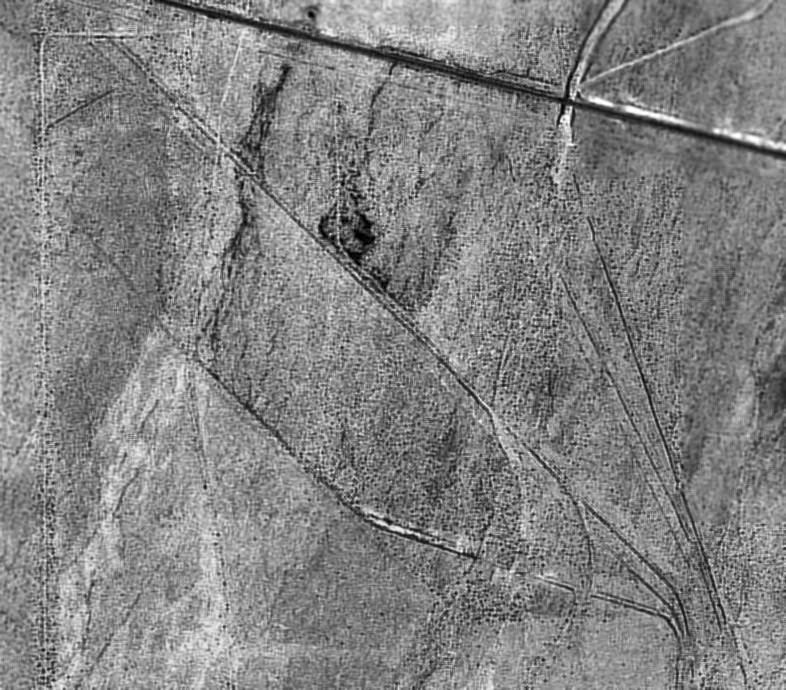 A 7/25/89 USGS aerial view looking northwest (enhanced by Bill Grasha) showed Surprise Springs while it was still operational. According to CWO2 John Lackie, “Surprise Springs was in operation until 1992. 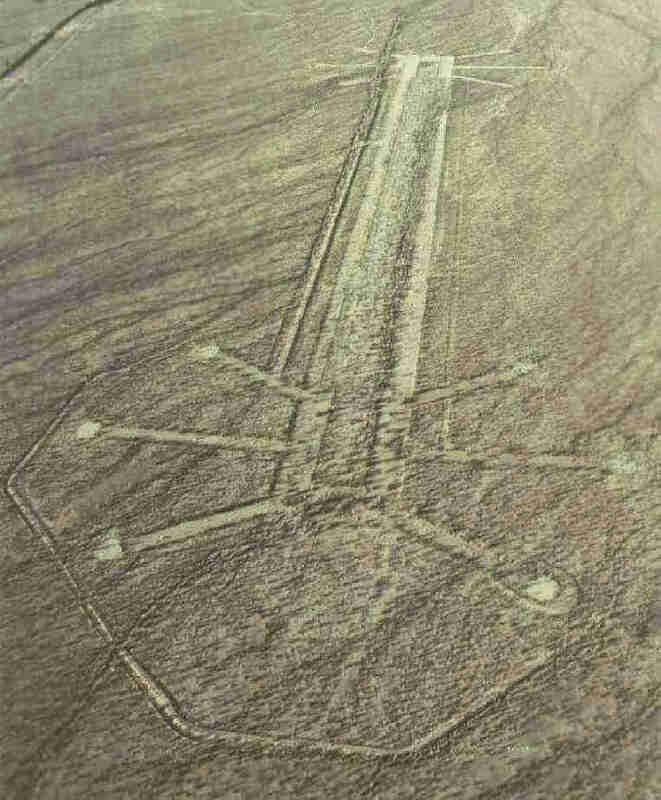 The airfield AM-2 surfacing was not removed until 1992. The airfield surfacing was pulled up & closed for operations because of environmental reasons. The airfield was built directly over the natural sub basin groundwater named 'Surprise Springs'. 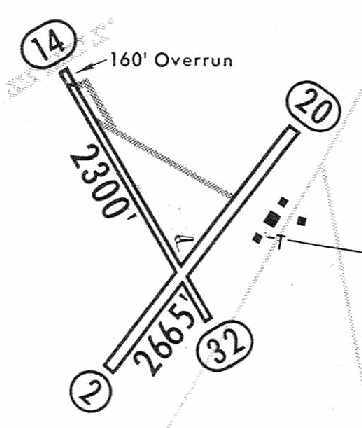 of a single 2,600' runway, oriented northwest/southeast. presumably after it was abandoned. which may have been used for helicopter vertical landings. 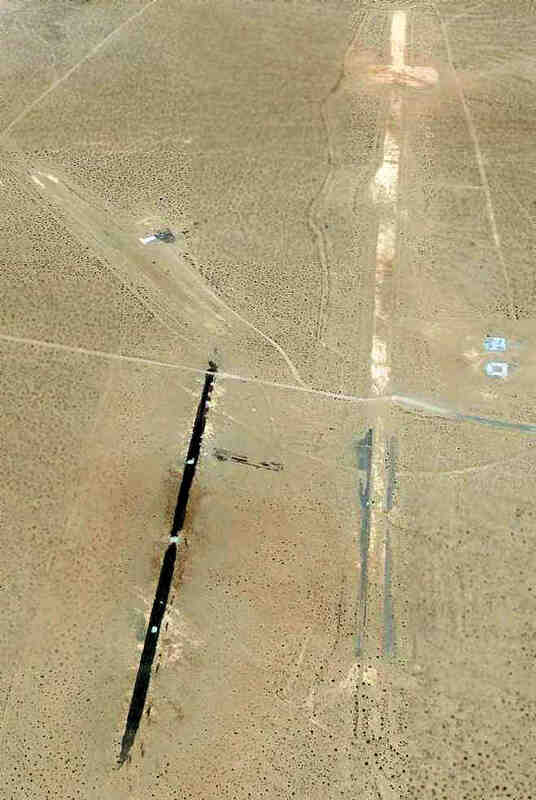 The 6 refueling berms were visible on the southwest side of the strip. There were no signs of any buildings at the site. "Surprise Springs VSTOL facility immediately west of EAF airport terminal area closed." on aeronautical charts or USGS topo maps of the area. 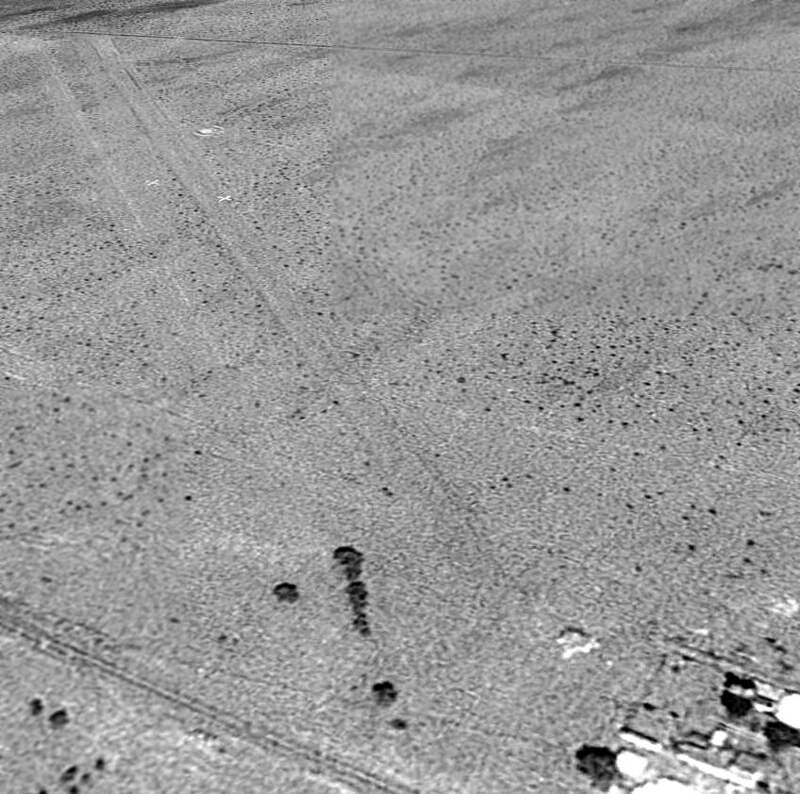 A 3/9/13 USGS aerial view looking northwest (enhanced by Bill Grasha) showed the abandoned Surprise Springs Airfield. and one mile east of Border Road. 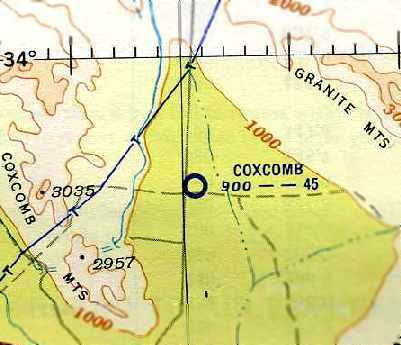 Coxcomb Airfield, as depicted on the March 1952 San Diego Sectional Chart (courtesy of Chris Kennedy). The Camp Coxcomb property consisted of a total of 10,400 acres. presumably the training operations at Camp Coxcomb (located on the opposite side of the road). The Army Corps of Engineers history of Camp Coxcomb included no mention of the airfield. which is when presumably the Camp Coxcomb airfield was abandoned. No airfield at Camp Coxcomb was depicted on the March 1951 San Diego Sectional Chart (according to Chris Kennedy). as that is how it was depicted on the March 1952 San Diego Sectional Chart (courtesy of Chris Kennedy). It depicted “Coxcomb” as having a 4,500' unpaved runway. as it was no longer depicted at all on the October 1958 San Diego Sectional Chart (according to Chris Kennedy). 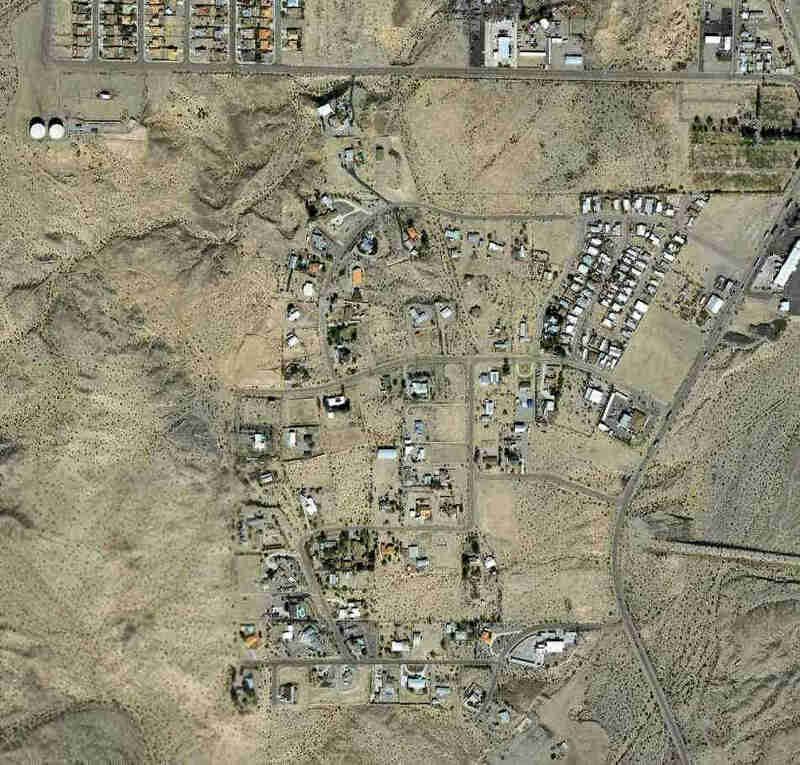 Most of the former Desert Training Center camps & airfields were depicted on recent USGS topo maps. on the 1963, 1969, 1986, or 1987 USGS topo maps of the area. running north/south, parallel to the highway. 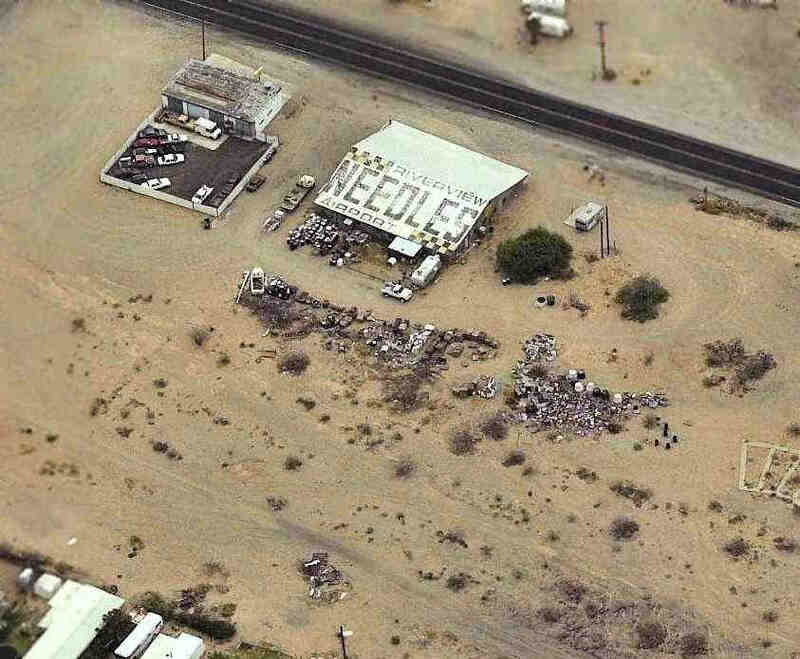 The street grid of the former camp on the opposite side of the road was also still recognizable in recent aerial photos. 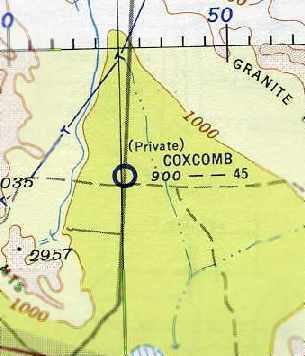 The Camp Coxcomb airfield was not depicted at all (even as an abandoned airfield) on 2002 aeronautical charts. Chris Kennedy visited Camp Coxcomb in 2003. He reported that "There is really nothing to identify it as an airstrip. It's just a slightly lighter section of gravel than the surrounding area." 24 miles southwest of Freda. 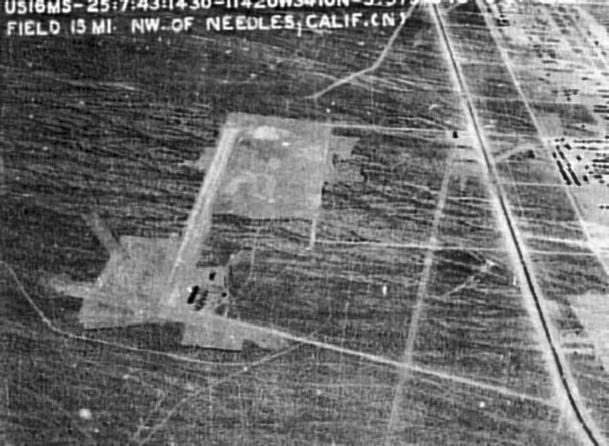 A 4/23/53 USGS aerial view of Camp Essex Airfield. to focus Army training efforts in areas with a desert terrain & environment. and designated General George S. Patton as the Center's Commanding General. making it the largest training area in the U.S.
Close to one million troops trained in this area between 1942-1944.
the Camp Essex site was established as one of the several divisional camps. In 1943, the Department of the Interior transferred 21,537 acres. An additional 8,998 acres was granted by permit. the 93rd Infantry Division among others. The only permanent structure constructed on the site was a 500,000 gallon concrete reservoir. 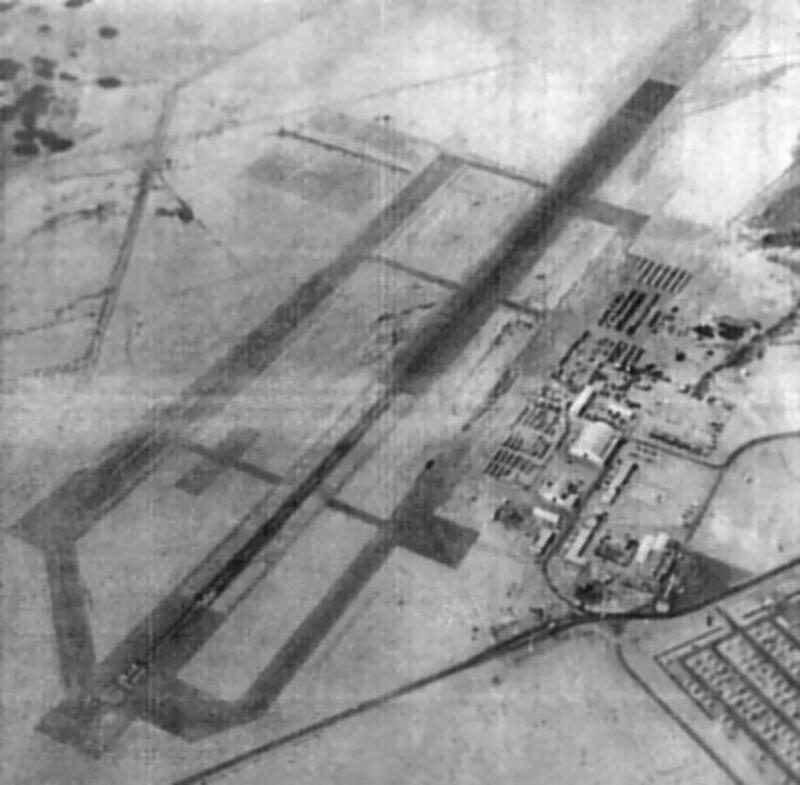 An airfield was built to support training operations. with 6 dispersal pads (?) surrounding each end of the 5,000' runway. Camp Essex was declared surplus in 1944. The Camp Essex airfield was not depicted at all on the 1944 LA Sectional Chart (courtesy of John Voss). In 1945, 21,537 acres were relinquished back to the Department of the Interior. The Camp Essex airfield was not depicted at all on the February 1949 LA Sectional Chart (according to Chris Kennedy). as that is how "Essex" was depicted on the 1954 Mojave Desert World Aeronautical Chart (courtesy of Chris Kennedy). 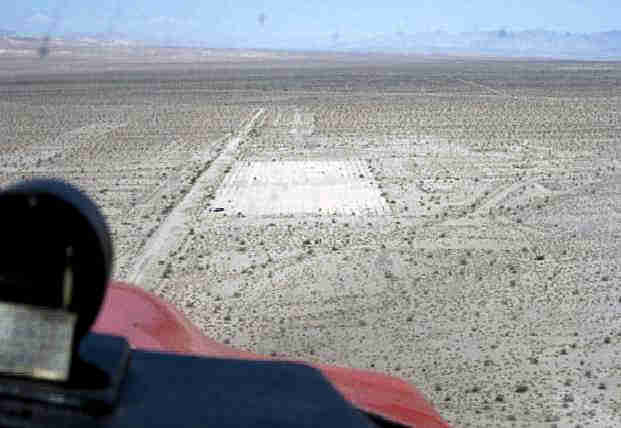 It was described as having a 4,900' unpaved runway. but labeled simply as “Landing Strip”. as it was no longer depicted at all on the March 1958 LA Sectional Chart (according to Chris Kennedy). 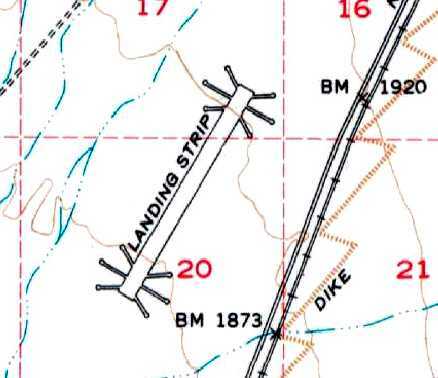 The Camp Essex airfield was still labeled "Landing Strip" on the 1985 USGS topo map (courtesy of Kevin Walsh). 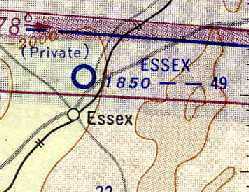 The Camp Essex airfield was it depicted at all (even as an abandoned airfield) on recent aeronautical charts. 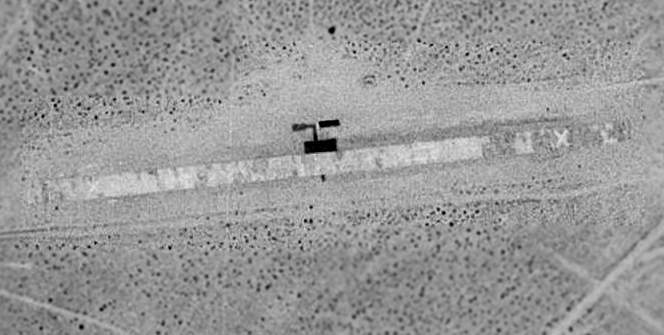 Aerial view of Camp Essex AAF, © 2002 by Larry Dighera. As seen in 2002, the Camp Essex airstrip & tie-down area were still in good condition. Fuel cans & the remains of lighting equipment still littered the area. the standard pattern for WW2 forward positioning fields. The 2 runways would permit a mass launch. supporting March Field in Riverside as well as the Desert Training Center." A 2003 photo by Chris Kennedy looking roughly north from the south end of the eastern-most runway at Camp Essex. 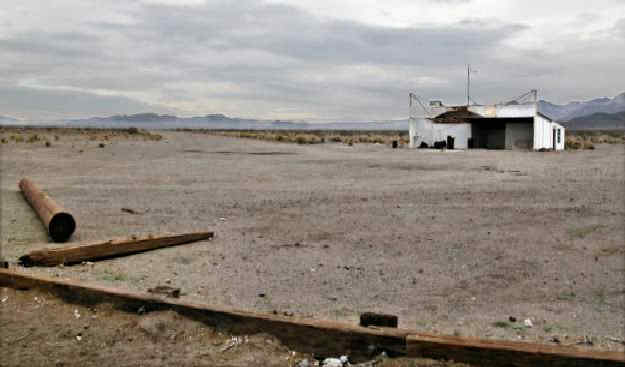 A 2003 view of an abandoned parking pad at the Camp Essex airfield, by Chris Kennedy. with the eastern-most one in very good shape for much of its length. although a few of them are crossed by a dry stream bed now. The parking pads at the end of the taxiways appear to be concrete. I didn't see any remains of buildings, although I didn't do a whole lot of exploring." A 1942 aerial view looking north at Rice AAF (courtesy San Bernardino County Library, via Rick Jackson, enhanced by Bill Grasha). and was operational by 1942. This presumably means that it existed before WW2 as a civil airport. but it was not depicted on a 1932 Los Angeles Airways Chart (courtesy of Scott O'Donnell). 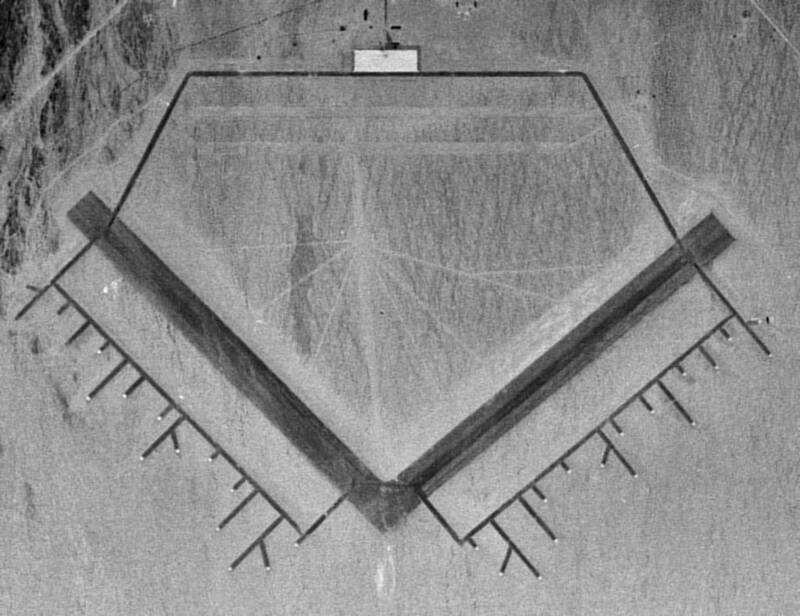 Rice Army Airfield was a subbase of Thermal Army Airfield. and numerous dispersal pads extending off the runways to the south. In order to house the more than 3,000 men, the Army constructed barracks & dormitories. The 1944 LA Sectional Chart (courtesy of John Voss) depicted Rice AAF as an active military airfield. By 1944, the airfield was assigned to March Field as a subbase. and the field was declared surplus on 10/31/44. 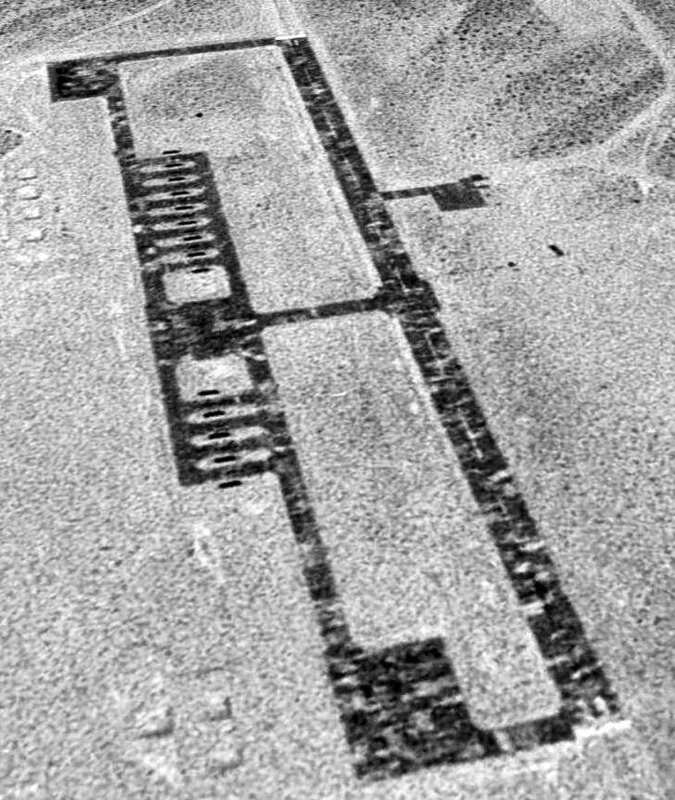 A 6/25/48 USGS aerial view (enhanced by Bill Grasha) showed the extensive facilities of Rice AAF evidently abandoned. 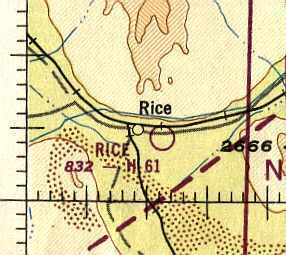 The Rice airfield was not depicted at all on the February 1949 LA Sectional Chart (according to Chris Kennedy). as that is how it was depicted on the 1949 Gila River World Aeronautical Chart (courtesy of Donald Felton). Rice was described as having a 6,100' hard-surface runway. Bob Howe reported, "My grandfather ran a small flight school there. After WW2 he (the Revered Gilbert Howe) taught missionaries to fly. I found out about Rice Field while listening to an old recording. In this tape, he mentioned taking over a hangar from the military." Rice was depicted as an active public-use airfield on the March 1952 San Diego Sectional Chart (courtesy of Chris Kennedy). 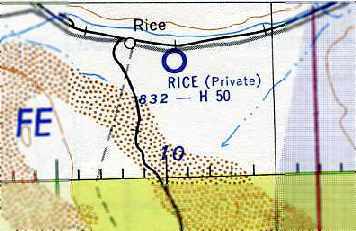 The chart depicted Rice as having a 5,000' paved runway. 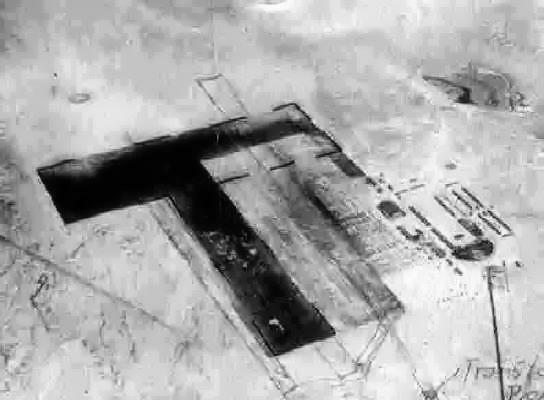 The 1954 USGS topo map depicted Rice Air Base as having 2 paved runways, taxiways, and a ramp. as that is how it was depicted on the September 1955 San Diego Sectional Chart (courtesy of Chris Kennedy). due to the low contrast between the airfield pavement & that of the surrounding desert. 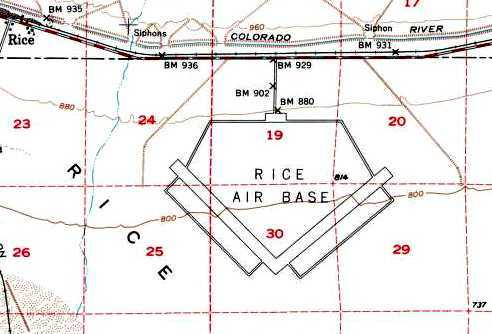 The Rice airfield was depicted as an abandoned airfield on the 1998 World Aeronautical Chart. Michael Grube visited the site of Rice in 2002. He reports, "I circled the perimeter of the field & the only concrete leftover is a large pad in the north. 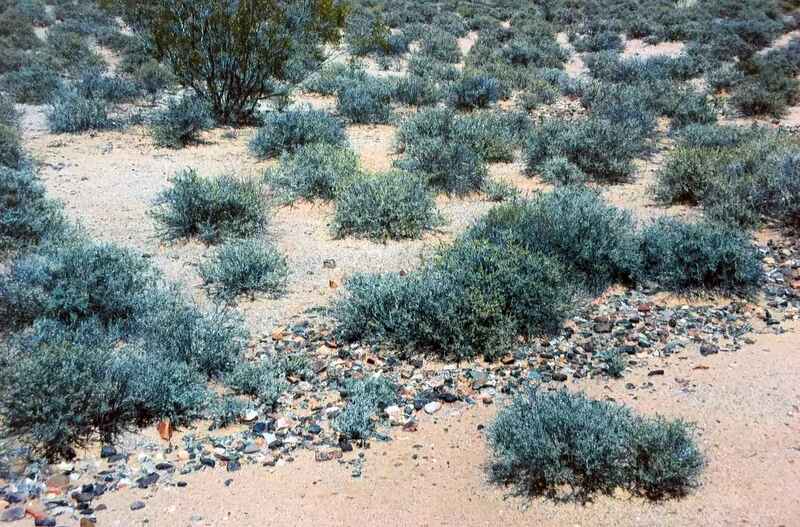 The rest is nothing more than desert gravel with only fewer tumbleweeds than the rest. There are no signs that the runways have ever been paved at all. No buildings or other structures remained." A 2003 photo by Chris Kennedy (enhanced by Bill Grasha) looking southeast at the abandoned NW/SE runway at Rice. Chris reported that "the Rice airfield is in even worse shape, at least the runways. Strangely, the taxiways & parking areas are in much better shape. The parking pads, which are at the end of the short extensions off of the main taxiways appear to be concrete. The taxiways seem to have once been oil over gravel & are easily discernable. 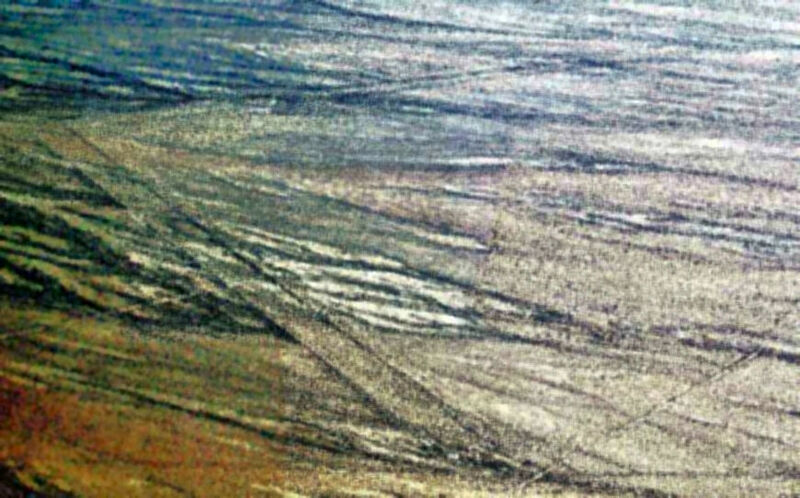 The picture of one of the runways shows that it just looks like a road across the desert. I did see the remains of some white paint at the end of one of them that might have been a runway number at one time. The are some old foundations & a very large concrete parking ramp." (which also still contained metal tie-down rings embedded in the concrete) at Rice. A 2003 photo by Don Barrett of the remains of a building foundation at Rice. A 2006 aerial photo by Joe Merkert (enhanced by Bill Grasha) looking north at the remains of Rice AAF. showing the pads used for aircraft tiedowns. A June 2009 aerial view by Woodrow Anselen (enhanced by Bill Grasha) looking west on final approach to the Rice AAF ramp. Woodrow reported, “Rice AAF looks pretty much the same as it did in the 2003 pictures. they tend to blend in with the surrounding desert. Down very low, I observed that they were really in poor shape & covered with lots of desert scrub bushes. I probably could have made a landing, but opted instead for a touchdown on the concrete pad at the northern portion of the base. 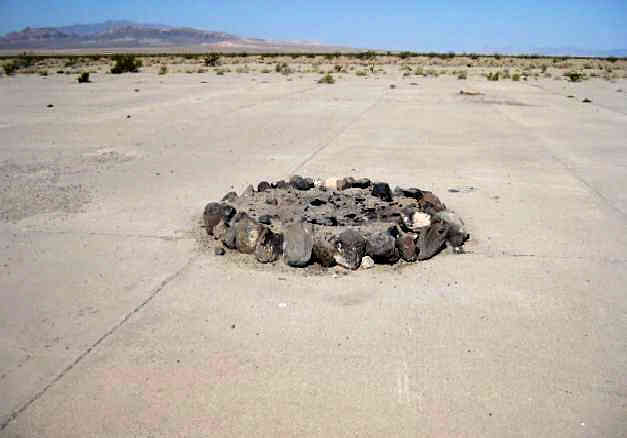 A June 2009 photo by Woodrow Anselen (enhanced by Bill Grasha) of a fire pit on rhe Rice AAF ramp. 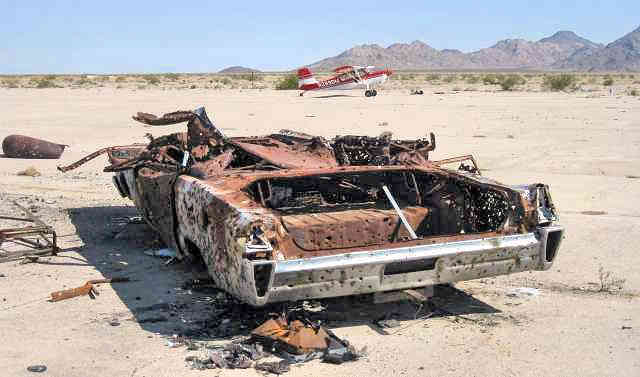 A June 2009 photo by Woodrow Anselen (enhanced by Bill Grasha) of the remains of a full-size 1965 Mercury on the Rice AAF ramp, with his Scout in the background. A June 2009 photo by Woodrow Anselen (enhanced by Bill Grasha) of a foundation at the site of Rice AAF. The date of construction of the Amboy Airport has not been determined. was an article entitled “Dedicate Air Highway Over Three States” in the 5/16/25 issue of The Oxnard Daily Courier (courtesy of Kevin Schumann). described the Amboy Airport as a "Permanent" field, measuring 1,750' x 200'. described the Amboy Airport as "Temporary (small)". The airfield configuration was said to be "runways 1,750' x 200' west by north." and measuring 2,640' x 300'. 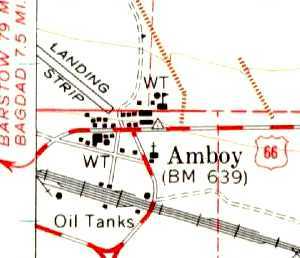 Amboy was depicted as an auxiliary airfield on the 1932 Los Angeles Airways Chart (courtesy of Scott O'Donnell). 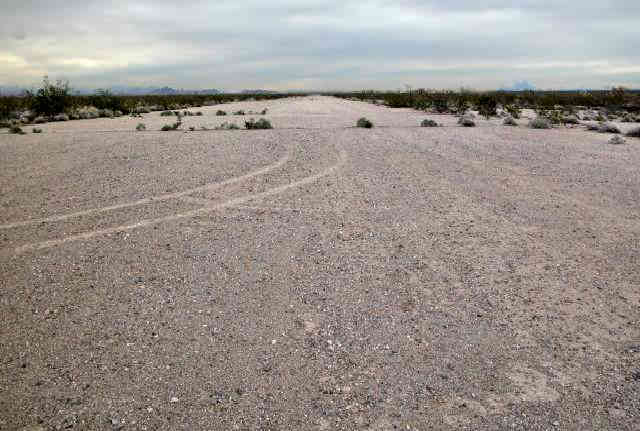 described Amboy Auxiliary Airport as a rectangular 1,400' x 150' sod & gravel landing area. (due to wartime security restrictions, like many other small civil airports during the war). It was not depicted at all on the 1941 LA Sectional Chart (courtesy of Chris Kennedy). 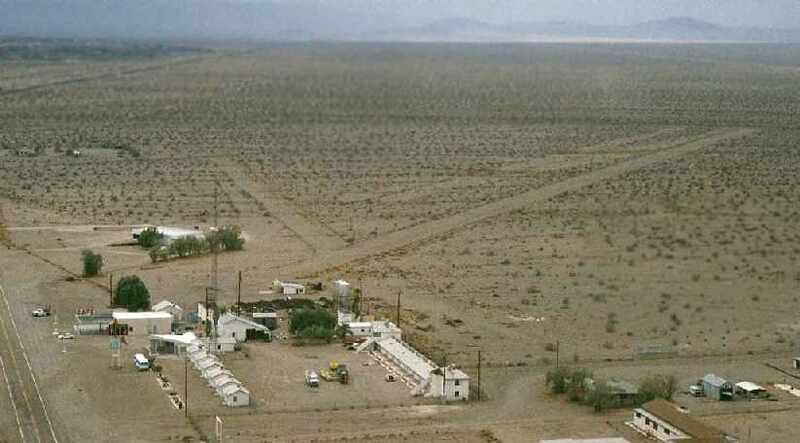 A minor Army encampment was established at Amboy in 1942 as part of the 12 million acre Desert Training Center. 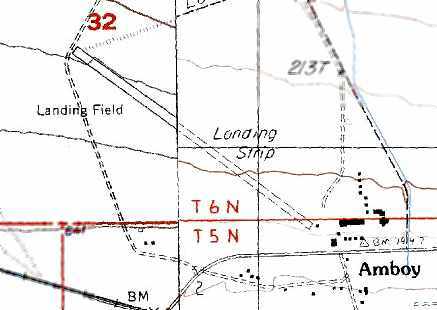 as no airfield at Amboy was depicted on the 1944 LA Sectional Chart (courtesy of John Voss). 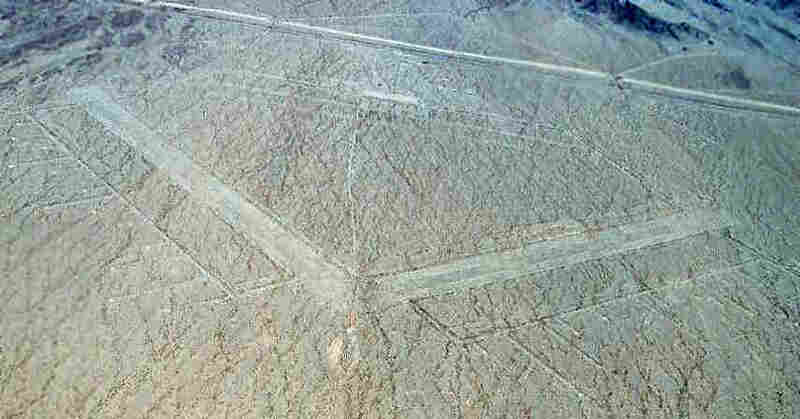 Francis Blake reported, "I have never seen any evidence that the runway at Amboy was military. but I don't believe it was built by or for the military." 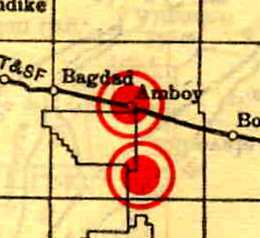 No airfield at Amboy was depicted on the 1949 LA Sectional Chart (according to Chris Kennedy). 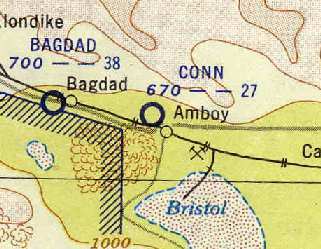 the Amboy Airfield was reopened, as "Conn" Airfield. That is how it was depicted on the 1954 Mojave Desert World Aeronautical Chart (courtesy of Chris Kennedy). It was described as having a 2,700' unpaved runway. with a cluster of small buildings along the southeast side. the name of the airfield was changed again, to "Roy". and was described as having a unpaved 3,700' runway. but the airfield's status had changed to a private field. 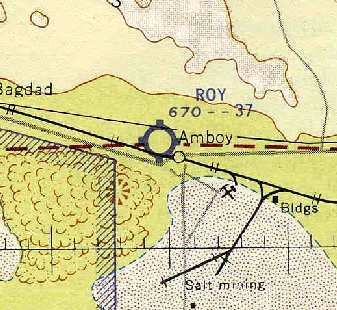 The 1984 USGS topo map depicted Amboy as having a single northwest/southeast runway, labeled as “Landing Strip”. 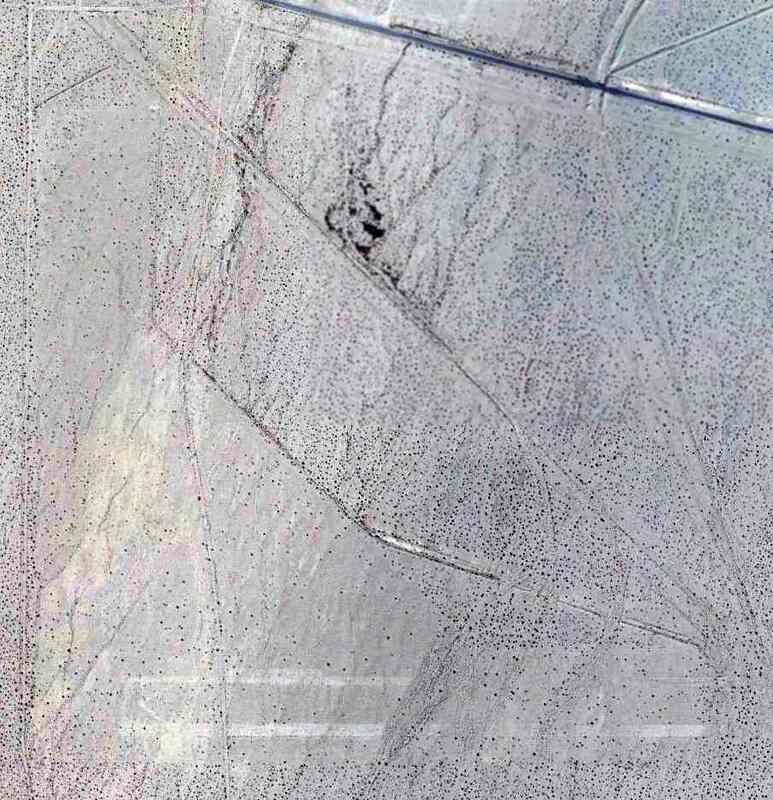 A 1995 USGS aerial view looking northwest showed Amboy Airport to have a single 4,000' runway. which are the complete extent of the town of Amboy. A parallel taxiway ran to the south of the runway, both of which were marked with closed “X” symbols. A shorter east/west runway extended away from the southeast end of the primary runway. 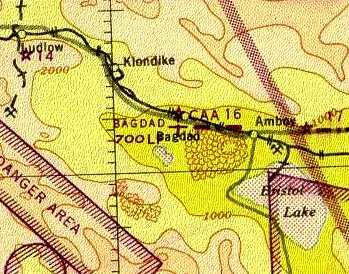 The airfield at Amboy was no longer depicted at all on the 1998 World Aeronautical Chart. 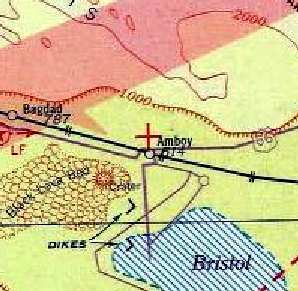 the Amboy Airport was not depicted at all (even as an abandoned airfield) on 2002 aeronautical charts. as well as a shorter crosswind runway (oriented east/west). 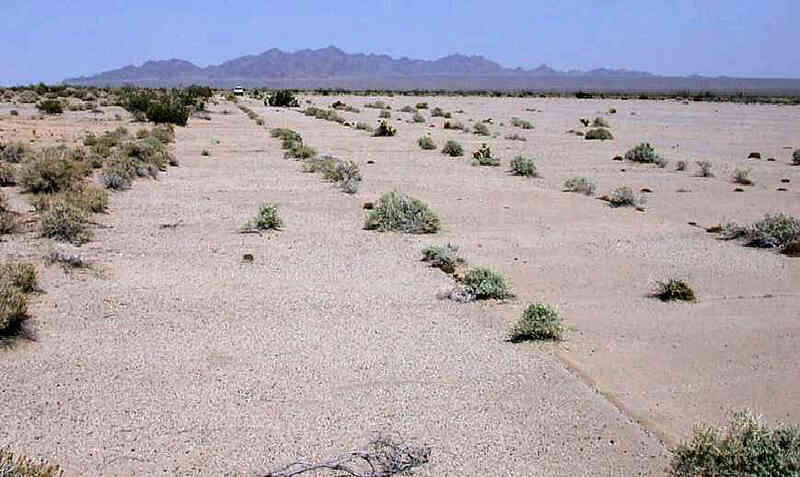 A 2003 view of the Amboy airstrip, looking northwest, by Chris Kennedy. It was about to rain, which is why the picture is a bit dark. Bob Jones reported in November 2004, "My friend Gary Lopes & I visited Amboy Airport last Saturday. I had called about 6 months before, to be sure that it was OK for us to land for breakfast & I was told that it was OK. The strip was in fair shape. It was only a little rough with only minor washout bumps & some small plants on the strip. We taxied over near the road & walked over to Roy's Cafe, only to find that it was closed. who told us that the restaurant is not always open. Indefinite, at best." A November 2004 photo by Bob Jones, taken while on final approach to the southeast to the Amboy runway. 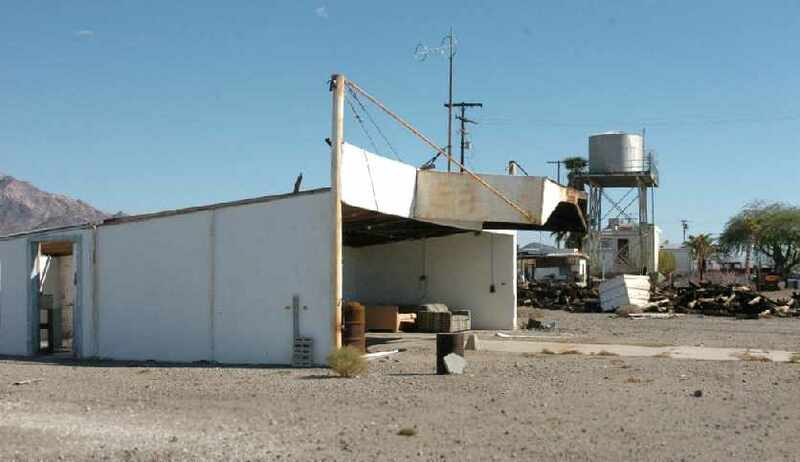 A November 2004 photo by Bob Jones of the T-hangar which remains standing at Amboy. 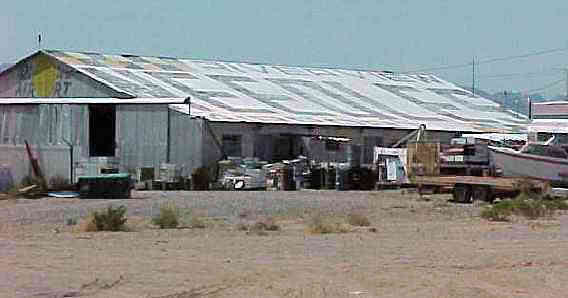 A November 2004 photo by Bob Jones of his Cessna 182 in front of the buildings at Amboy. and we stopped in & checked to see if the restaurant was open. It was not so I snooped around a little & ran into a nice guy named Larry. He said that the health department closed the restaurant down. The whole town of Amboy has been bought by an investor (Albert Okura, owner of the Juan Pollo restaurant chain) & is in the process of being rebuilt. Larry is friendly & will entertain you as long as you want. He said anyone can fly into Amboy if they want to no prior permission required. I walked the runway because Larry claimed he just had it redone & sure enough it was smooth enough for me. but Roy's Cafe is closed indefinitely (looks like remodeling). and there's a hand-written sign in the window that has a phone number for people to call 'for emergency gas'. (there's also a newspaper article in the window of the gas station talking about this). His plans were to restore everything, but I don't know how he's faring. 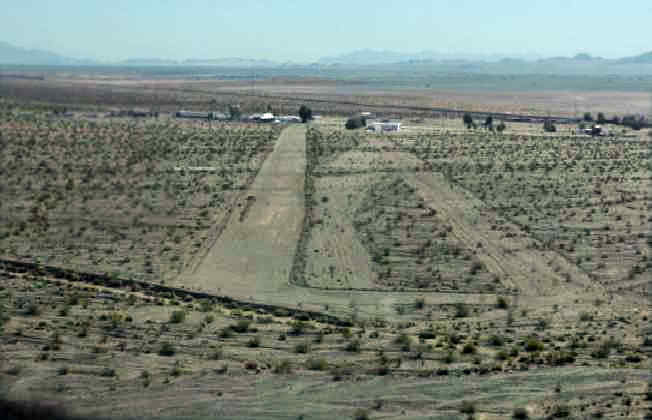 A 2014 aerial view looking northwest at the Amboy airfield shows the 2 runways to remain intact. at the tiny town of Amboy.